Kevin Seeldrayers (Quick Step) s.t. Sunday, December 14: Fotoreporter Sirotti sent me a few pictures of the 2009 Giro presentation. Thursday, May 7: The teams entered in the Giro were presented to the press. 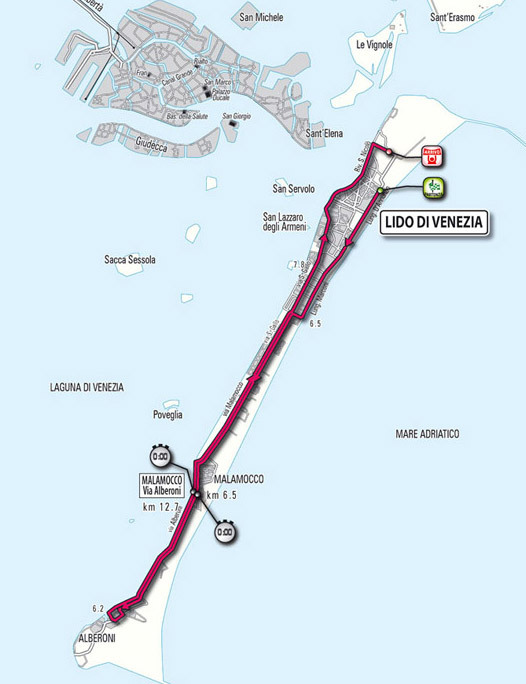 May 9, Saturday: Stage 1, Lido di Venezia, 20.5 km. Team time trial. Weather: At 3:30 PM local time, 70F (21C), clouds, wind at 3 mph (5kph) from the east. 60% chance of light rain in the early evening. That could affect the late starters. 2. Marco Pinotti (High Road) s.t. 3. Edvald Boasson Hagen (High Road) s.t. 4. Michael Rogers (High Road) s.t. 5. Thomas Lovkvist (High Road) s.t. 6. Mark Renshaw (High Road) s.t. 7. Kanstantsin Siutsou (High Road) s.t. 8. Morris Possoni (High Road) s.t. 9. Michael Barry (High Road) s.t. 11. Tom Danielson (Garmin-Slipstream) s.t. 12. Tyler Farrar (Garmin-Slipstream) s.t. 13. Christian Vande Velde (Garmin-Slipstream) s.t. 14. Bradley Wiggins (Garmin-Slipstream) s.t. 16. Janez Brajkovic (Astana) s.t. 17. Christopher Horner (Astana) s.t. 18. Yaroslav Popovych (Astana) s.t. 19. Levi Leipheimer (Astana) s.t. 20. Jose Luis Rubiera (Astana) s.t. Start list: Team time trial start times in Italian local time. Eastern USA time is 6 hours behind, Pacific is 9 hours behind Italian time. So Astana, the last team off, will go at 11:20 AM Eastern Daylight time. The organizers are expecting average speeds of between 51 and 55 km/hr which means the elpased times should come in from 22min and 20sec to 24min. Stage 1 route map. The grey islands in the upper left are the city of Venice with its famous canals. Stage 1 elevation guide, pan flat. 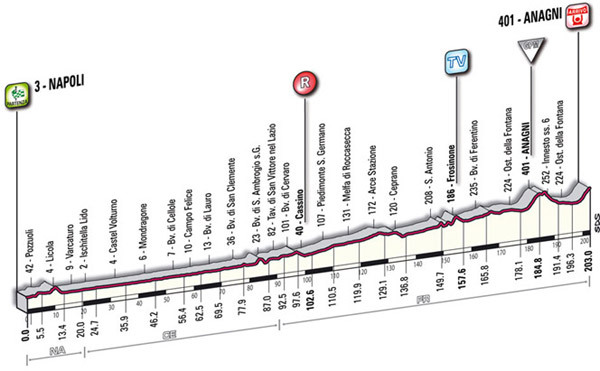 May 10, Sunday: Stage 2, Jesolo - Trieste, 156 km. Flat stage. Weather in Trieste: Clear, 73F (23C), wind from WSW at 3 mph (5 kph). 2. Mark Cavendish (Columbia) s.t. 3. Ben Swift (Katusha) s.t. 4. Alan Davis (Quick step) s.t. 5. Tyler Farrar (Garmin-Slipstream) s.t. 6. Oscar Gatto (ISD) s.t. 7. Francesco Gavazzi (Lampre) s.t. 8. Davide Vigano (Fuji-Servetto) s.t. 9. Manuele Mori (Lapre) s.t. 10. Dries Devenyns (Quick step) s.t. 11. Thomas Fothen (Milram) s.t. 13. Jackson Rodriguez (Serramenti PVC-Diquigiovanni) s.t. 14. Steve Chainel (Bouygues Telecom) s.t. 15. Mauricio Alberto Ardila (Rabobank) s.t. 16. Stefano Garzelli (Acqua & Sapone) s.t. 17. Philip Deignan (Cervelo) s.t. 18. Jens Voigt (Saxo) s.t. 19. Thomas Rohregger (Milram) s.t. 20. Tadej Valjavec Ag2R) s.t. 26. Damiano Cunego (Lampre) s.t. 30. Denis Menchov (Rabobank) s.t. 36. Gilberto Simoni (Serramenti PVC-Diquigiovanni) s.t. 37. Christian Vande Velde (Garmin0-Slipstream) s.t. 39. Carlos Sastre (Cervelo) s.t. 40. Danilo Di Luca (LPR) s.t. 42. Lance Armstrong (Astana) s.t. 97. Levi Leipheimer (Astana) s.t. 3. Michael Rogers (Columbia) s.t. 5. Edvald Boasson Hagan (Columbia) s.t. 7. Alessandro Petacchi (LPR) s.t. 9. Bradley Wiggins (Garmin Slipstream) s.t. 11. Jose Luis Rubiera (Astana) s.t. 12. Marco Pinotti (Columbia) s.t. 17. Janez Brajkovic (Astana) s.t. 18. Levi Leipheimer (Astana) s.t. 20. Dmytro Grabovskyy (ISD) s.t. 3. Edvald Boasson Hagen (Columbia) s.t. The finish: All together for the sprint. It was a drag race between Alessandro and Cavendish. Cavendish was sitting in second place with Petacchi right behind. Petacchi came off his wheel and as he rode next to Cavendish, Cavendish was boxed. When Cavendish could get out and chase, it was too late. Petacchi wins the stage, Cavendish was second.. Cavendish should remain the Maglia Rosa. 6 km to go: Astana has moved to the front. Armstrong is riding second. 11 km to go. Bell lap. Still all together. Pink jersey'd Cavendish has moved towards the front. Columbia, ISD, Liquigas and Lampre have riders at the front. No one seems to be in charge of things right now. 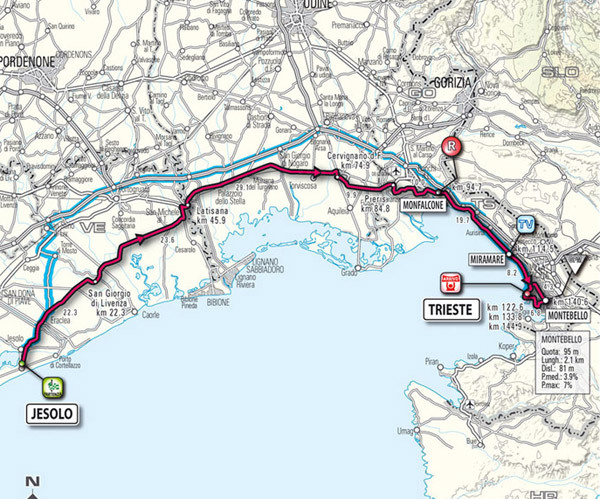 20 km to go: The pack is together as the race does the last 2 circuits in the city of Trieste. Garmin-Slipstream and Columbia riders are doing the work of keeping the speed high to keep things together. Even so, the attacks keep firing off the front. Garzelli is taking his chances as I write this. Stage 2 route map. Venice is to the west and south. 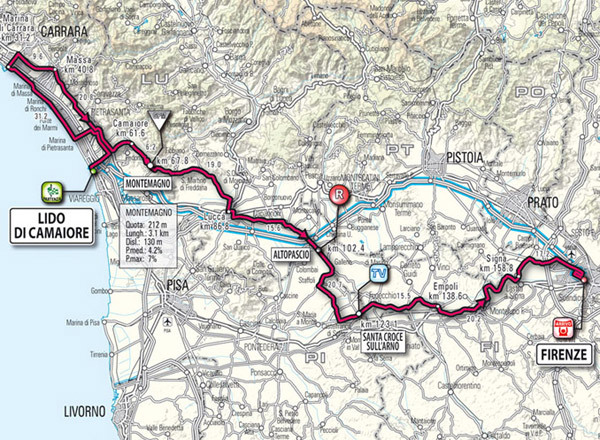 May 11, Monday: Stage 3, Grado - Valdobbiadene, 200 km. Flat stage. Weather: Cloudy, going to 81F (27C). Only a 20% chance of rain. Wind from SSW at 5 to 10 mph (8 to 15 kph). 2. Tyler Farrar (Garmin-Slipstream) s.t. 4. Dario Cataldo (Quick Step) s.t. 6. Philipe Gilbert (Silence-Lotto) s.t. 7. Oscar Gatto (ISD) s.t. 8. Michael Rogers (Columbia) s.t. 9. Anders Lund (Saxo) s.t. 10. Stefano Garzelli (Acqua & Sapone) s.t. 11. Enrico Gasparotto (Lampre) s.t. 12. Danilo Di Luca (LPR) s.t. 13. Jens Voigt (Saxo) s.t. 14. Eduar Vorganov (Xacobeo) s.t. 15. Thomas Rohregger (Milram) s.t. 16. Philip Deignan (Cervelo) s.t. 17. Jackson Rodriguez (Serramenti PVC-Diquigiovanni) s.t. 19. Kevin Seeldrayers (Quick Step) s.t. 20. Pablo Lastras Garcia (Caisse d'Epargne) s.t. 21. Gilberto Simoni (Serramenti PVC-Diquigiovanni) s.t. 33. Ivan Basso (Liquigas) s.t. 44. Levi Leipheimer (Astana) s.t. 46. Carlos Sastre (Cervelo) s.t. 50. Lance Armstrong (Astana) s.t. 62. Denis Menchov (Rabobank) s.t. 8. Levi Leipheimer (Astana) s.t. 12. Daniele Pietropolli (LPR) s.t. 13. Gabriele Bosisio (LPR) s.t. 17. Manuele Mori (Lampre) s.t. 18. Marzio Bruseghin (Lampre) s.t. 19. Enrico Gasparotto (Lampre) s.t. 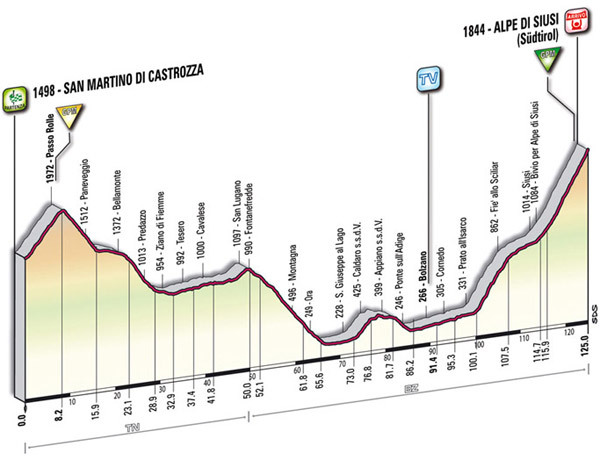 May 12, Tuesday: Stage 4, Padova - San Martino di Castrozza, 165 km. High mountains with a hilltop finish. Weather: In Belluno, slightly to the east of the route, it's 73F (23C), cloudy with a 3 mph (5 kph) breeze from the east. 4. Juan Mauricio Soler (Barloworld) s.t. 5. Gilberto Simoni (Serramenti PVC-Diquigiovanni) s.t. 7. Thomas Lovkvist (Columbia) s.t. 8. Ivan Basso (Liquigas) s.t. 9. Denis Menchov (Rabobank) s.t. 10. David Arroyo Duran (Caisse d'Epargne) s.t. 11. Yaroslav Popovych (Astana) s.t. 12. Chris Horner (Astana) s.t. 13. Tadej Valjavec (Ag2R) s.t. 14. Damiano Cunego (Lampre) s.t. 15. Marzio Bruseghin (Lampre) s.t. 16. Carlos Sastre (Cervelo) s.t. 18. Feliz Rafael Cardenas (Barloworld) s.t. 19. Joaquin Rodriguez (Caisse d'Epargne) s.t. 20. Michael Rogers (Columbia) s.t. 5. Levi Leipheimer (Astana) s.t. 9. Marzio Brusighin (Lampre) s.t. 10. Carlos Sastre (Cervelo) s.t. 14. Felix Rafael Cardenas (Barloworld) s.t. 16. Denis Menchov (Rabobank) s.t. The finish: Di Luca leading the pack catches Soler just at the line. Di Luca takes the stage. 2 km to go: Bam! Juan Mauricio Soler takes off. Liquigas is chasing hard. 3 km to go: Voigt gives up and is caught. Garzelli is hovering right near the front, just behind the Liquigas riders. Arsmtrong's postion in the pack is a bit better. He keeps moving up. 4 km to go: Liquigas is at the front. Basso is sitting in third place. Voigt's lead is 30 seconds. 6 km to go: Voigt looks like pure determination, back flat, powerfully stroking the pedals. He has 1min 15sec. Armstrong is sitting about 2/3's back in the pack. He must not be feeling too fresh. Usually Armstrong rides these climbs near the front. Barloworld's Soler tries an attack and gives up. 7 km to go: Voigt attacks and drops Bellotti. Voigt has 1min 20sec. 10 km to go: The lead is now 1min 41sec. Garzelli had moved behind the LPR guys with one of his teammates at the front. Now the lead is 1min 30sec. 12 km to go: Voigt and Bellotti have dropped De Bonis. Their lead is about 2 minutes. In the pack Armstrong is wearing his race face, he's taken off his sunglasses. Di Luca is leading the peloton. 3 LPR riders at the front with Lampre right behind them. 15 km to go: The climb is about to get steep. The peloton is stretched out. The break's lead is down to 2min 38sec. Petacchi is over 8 minutes back. 20 km to go: Little rings. Time to go to work. Break's lead is now 2min 53sec. 30 km to go: with the final climb beginning: The break of Bellotti, De Bonis and Voigt has extended their lead to 4 min 45sec. Km 120: Over the top of the 2nd category Croce d'Aune 3 riders were away. The sprint for the KOM points went in this order: Francesco Bellotti (Barloworld), Francesco De Bonis (Serramenti PVC-Diquigiovanni) and Jens Voigt (Saxo). The peloton with the contenders (less Di Luca) is led by Liquigas. They went over 4min 15sec behind the Voigt group. Di Luca, who had a flat, was a further minute behind. Pink Jersey Petacchi is well back, of course with the other non-climbers. Armstrong looked to be in no trouble. Di Luca has regained the peloton. 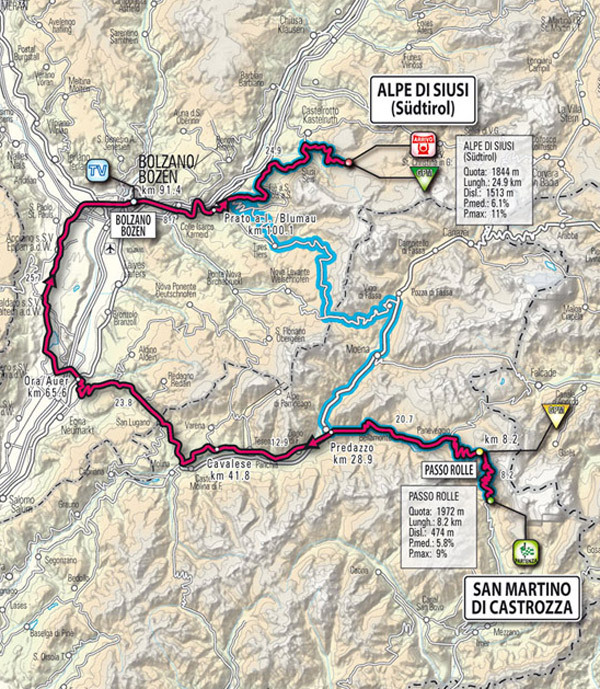 May 13, Wednesday: Stage 5, San Martino di Castrozza - Alpe di Siusi, 125 km. High mountains with a hilltop finish. Weather in Bolzano: 72F (22C), partly cloudy with the wind at 5 mph (8 KPH) from the SSW. Forcast is 70% chance of rain in the afternoon. 6. Chris Horner (Astana) s.t. 9. Michael Rogers (Columbia) s.t. 10. Fredrik Kessiakoff (Fuji-Servetto) s.t. 14. Gilberto Simoni (Serramenti PVC-Diquigiovanni) s.t. The finish: Sastre tried to lead it out. Menchov with Di Luca on his wheel swept by him. Menchov had a solid lead at the line. Menchov takes the stage and Di Luca probably takes the Pink Jersey. Armstrong crosses the line about 3 minutes after Menchov. 1 km to go: The 6 are still together with Di Luca leading but looking tired. 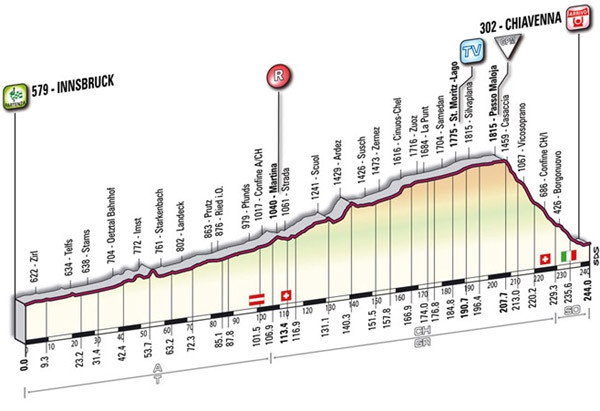 2 km to go: It's Basso, Di Luca, Sastre, Leipheimer Menchov and Horner. Lovkvist is dropped. Di Luca is at the front and Lovkvist is back on. 3 km to go: Basso has gone to the front. Pellizotti and Sastre are gone. Di Luca is glued to Basso's wheel. Simoni is dropped. Sastre has clawed his way back to the lead group. Basso actually looks like he's working. Menchov has moved up. Looks like it's down to about 6 riders in the lead group. Lovkvist is hanging on to the back of the lead group. 6 km to go: Riders are dropping like flies. Armstrong is still hanging on the back with a couple of teammates. Liquigas is down to 3. Armstrong looks to have been gapped. Garzelli is in trouble as well. Sastre, Leipheimer, Lovkvist, Soler, Cunego, Basso, Di Luca are still up front. Now Cunego is off. 10 km to go: Simoni, Sastre, Armstrong, Menchov and the other contenders are near the front, sitting behind the Liquigas train. The break has been caught. The gradient is almost 9 percent. Giampaolo Cheula of Barloworld has counter-attacked. Now Devenyns of Quick Step tries his luck. Devenyns and Cheula have almost linked up. Both are quickly caught. Armstrong is sitting near the back of the pack. Leipheimer is well-placed. 15 km to go: Now there are 6 Liquigas riders at the front of the pack. Basso and Pellizotti clearly have plans. The Voeckler break lead has shrunk to 59sec. Voeckler himself has been yo-yoing off the back of the break. The peloton is still rather large so the climbers haven't started throwing high heat yet. Astana seems to be moving up now. 20 km to go: The lead is down to 2min. Liquigas has 4 men at the front followed by Di Luca and Lovkvist. All the other big guns seem to be up there as well. The Liquigas pace must be rather hot, the peloton is a long single-file line. 25 km to go: A break of 6 (Voeckler, Capecchi, Pietropolli, Serpa, Ochoa and Visconti) is 2min 23 seconds ahead of the peloton. Quinziato of Liquigas is leading the peloton. 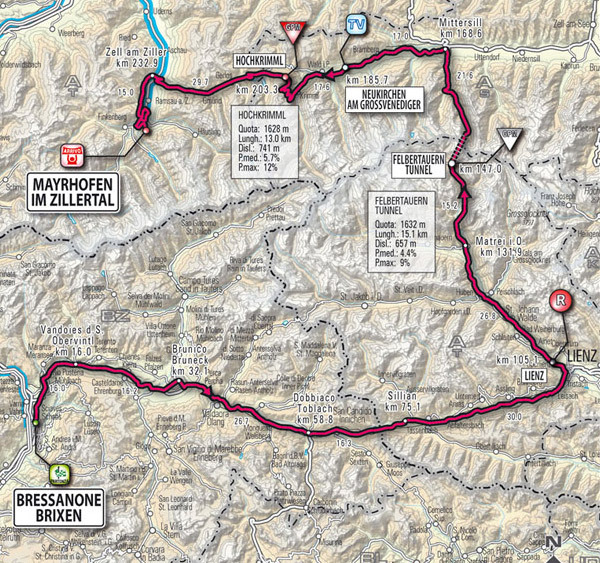 May 14, Thursday: Stage 6, Bressanon/Brixen - Mayrhofen (Austria), 248 km. Mixed terrain. Weather at Lienz, Austria at 1 PM local time: 66F (19C), partly cloudy with very little wind. 3. Allan Davis (Quick Step) s.t. 4. Filippo Pozzato (Katusha) s.t. 5. Matthew Harley Goss (Saxo) s.t. 7. Enrico Gasparotto (Lampre) s.t. 9. Danilo Di Luca (LPR) s.t. 10. Tadej Valjavec (Ag2R) s.t. 11. Jackson Rodriguez (Serramenti PVC-Diquigiovanni) s.t. 13. Denis Menchov (Rabobank) s.t. 14. Thomas Rohregger (Milram) s.t. 15. Eduard Vorganov (Xacobeo) s.t. 16. Thomas Lovkvist (Columbia) s.t. 17. Andriy Grivko (ISD) s.t. 18. Franco Pellizotti (Liquigas) s.t. 19. Ivan Basso (Liquigas) s.t. 20. Levi Leipheimer (Astana) s.t. 29. Damiano Cunego (Lampre) s.t. 30. Stefano Garzelli (Acqua & Sapoine) s.t. 44. Guilberto Simoni (Serramenti PVC-Diquigiovanni) s.t. Km 106: The Giro has arrived in Austria. The riders are passing through Lienz. At kilometer 55 a group of 5 escaped: Guillame Bonnafond, Vasili Kiryienka, Oscar Gatto, Michele Scarponi and Kaspar Klostergaard. Their lead is currently 6min 32sec. Km 137: I've been asked to stack the updates downward from now on. I hope that makes them easier to follow. The break's lead is up to 7 minutes. The LPR team of Maglia Rosa Danilo Di Luca is leading the field. Km 147: At the Felbertauren KOM, the lead grew to 8min 24sec. None of the breakaway riders are real GC threats if the pack decides to start chasing. The best-placed of them is Scarponi, at 6min 19sec. 75 km to go: The break is getting reeled in. The gap is down to 5min 45sec. The last hour was raced at 44.1 km/hr. 30 km to go: The break came apart. Scarponi went over the top of the Hochkrimml alone. Garzelli set off from the pack on a solo chase. Kiiyienka joined Scarponi on the descent but flatted. The peloton is 3min 40sec behind Scarponi. Bonnafond and Gatto are in the middle. 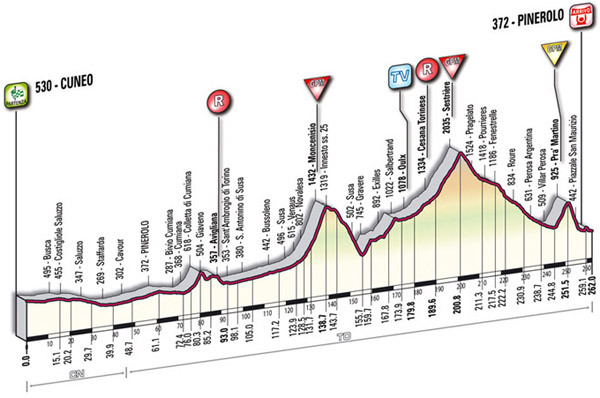 25 km to go: So here's the situation: Scarponi then Kiryienka @ 11sec then Bonnafon/Gatto (I think) @ 1min 33sec and the Maglia Rosa group @ 2min 26sec. OK, Kiryienka has caught Scarponi. Average speed for the day so far is 42.369. Quick Step is at the front of the pack leading the chase. It is really strung out. 9 km to go: Bonnafond and Gatto have been caught. Scarponi has dropped Kiryienka who has cramps. The gap is 1min 22sec. Katusha is helping Quick Step with the chase. Man, they are hammering away. 6 km to go: 1min 8sec. Petacchi is moving up, past Armstrong and another Astana rider. 5 km to go: 1min 2sec. Might Scarponi pull this off? 4 km to go: 1min 3sec. Scarponi is almost a kilometer ahead. That's a lot of distance to close in such a short time. 2 km to go: Still about a minute. Final kilometer: Scarponi about has it. A terrific stage win. Kiryienka has been caught. The finish: Michele Scarponi (Serramenti PVC-Diquigiovanni) was won stage 6. Edvald Boasson Hagen took the field sprint. 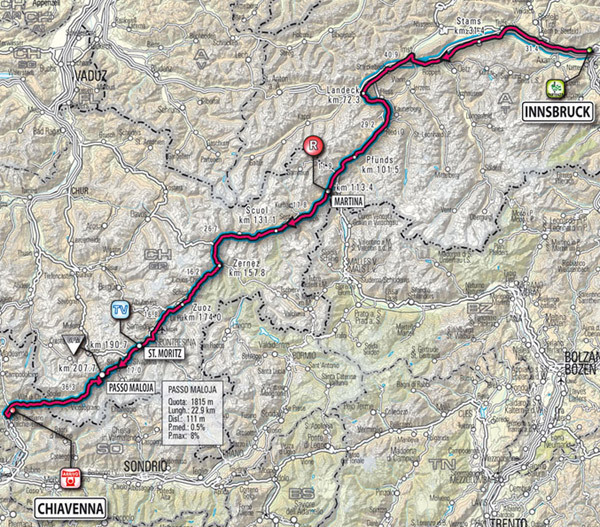 May 15, Friday: Stage 7, Innsbruck (Austria) - Chiavenna, 244 km. Mixed terrain. Weather in St. Moritz, Switzerland (Km 190): At Noon local time it was 47F (8C) with almost no wind. The forcast was for a 60% chance of light rain in the afternoon. Some news: Angry that they have not been paid for 2 months, the Astana riders blocked out their sponsors' names on their jerseys today. Team manager Johan Bruyneel said, "..we don't want to pretend as if everything is OK. It's not OK." There is one Kazakh rider on the Astana Giro squad, Anthony Zeits. He did not alter his jersey. The UCI has given the Kazakh-sponsored team until the end of May to get its financial house in order. If not, the team's Pro Tour license will probably be pulled. 2. Robert Hunter (Barloworld) s.t. 3. Pavel Brut (Katusha) s.t. 4. Davide Vigano (Fuji-Servetto) s.t. 5. Alessandro Bertolini (Serramenti PVC-Diquigiovanni) s.t. 8. Allan Davis (Quick Step) s.t. 9. Robert Forster (Milram) s.t. 11. Mark Cavendish (Columbia) s.t. 12. Francesco Gavazzi (Lampre) s.t. 13. Tyler Farrar (Garmin) s.t. 14. Sebastien Hinault (Ag2R) s.t. 15. Alessandro Petacchi (LPR) s.t. 16. Alexander Serov (Katusha) s.t. 17. Eduard Vorganov (Xacobeo) s.t. 18. Said Haddou (Bouygues Telecom) s.t. 19. Manuele Mori (Lampre) s.t. 20. Thomas Rohregger (Milram) s.t. 26. Michael Rogers (Columbis) s.t. 29. Chris Horner (Astana) s.t. 32. Damiano Cunego (Lampre) s.t. 60. Ivan Basso (Liquigas) s.t. 62. Stefano Garzelli (Acqua & Sapone) s.t. 84. levi Leipheimer (Astana) s.t. 94. Denis Menchov (Rabobank) s.t. 98. Carlos Sastre (Cervelo) s.t. 110. Danilo Di Luca (LPR) s.t. 130. Gilberto Simoni (Serramenti PVC-Diquigiovanni) s.t. Km 144, 100 to go: A break of 4 went at almost from the gun: Bartosz Huzarski (ISD), Mauro Facci (Quick Step), Serguei Klimov (Katusha), Vladimir Isaichev (Xacobeo). Their lead is currently 3min 55sec. At one point the break's lead was over 9 minutes. Km 160: The lead is 3min 10sec. Milram, Garmin and Columbia are leading the pack. It's starting to rain further down the race course. That might make for a dicey trip on the long, high-speed descent into Chiavenna. 75 km to go: The lead continues to shrink. It's 2min 48sec. I don't think they are going to let this one get away the way they did yesterday. 60 km to go: In preparation for the descent riders are putting on warm gloves, vests, arm warmers and jackets. No rain is falling on the riders right now. Angry clouds seem to loom overhead. The lead is down to 2min 2sec. Average speed for the stage so far: 39.483 km/hr. Di Luca is wearing leg warmers as well as arm warmers and clear rain jacket. Now rain has started to fall on the race. 59 km to go: Looks like the pack doesn't want to catch the break too soon. The lead has stretched back out to 2min 20sec. The pack looks all bundled up. Astana has left the Trek and Nike and one Kazakh company's logos on their jerseys because they have paid. Their rain jackets are black. 52 km to go: The break didn't fight for the St. Moritz intermediate sprint. Mauro Facci (Quick Step) led them across the line. The pack crossed the sprint line 1min 50sec after the break. 50 km to go: The teams have been warned that visibility at the summit before the descent is very poor. The break's lead is now 1min 30sec. None of the riders in the break is a GC threat. As we close in on the Passo Maloja the gap falls still more. Now it's only 30sec. The gap has fallen to 18sec. Armstrong and a couple of teammates have moved to the front before the descent. Obviously he wants to stay out of trouble on the fast, wet roads. 46 km to go: As the descent of the Maloja begins the break is caught. All but Facci, who keeps pressing on alone with a dark, looming peloton only a few meters behind. It's over for Facci. Gruppo Compatto. Now they go down the mountain. It's very foggy, very wet and fast. Tyler Farrar (Garmin-Slipstream) took the Maloja KOM sprint. 31 km to go: Most of the pack is descending with caution. Alessandro Bertolini (Serramanti PVC-Diquigiovanni) is a little off the front descending as if his last will and testament has been completed and notarized. He has a 19sec lead. 30 km to go: Liquigas is leading the chase to bring Bertolini back to the pack. The worst of the fog seems to be behind the race now. The descent has broken things up. There are little groups chasing, trying to regroup. Bertolini has 40 seconds. He's about an hour behind on GC. 25 km to go: Bertolini is taking terrible chances on the rainy descent. His lead is 1min 2sec. Average speed for the day so far is 39.666 km/hr. 20 km to go: 48 seconds. That's a small lead for so far to go. Pavel Brut of Katusha is trying his luck, but he's not getting far. 12 km to go: Bertolini has been caught by Brut, Hunter, Vigano and Boasson Hagen . They have about 26sec. Andriy Grivko is trying to bridge the gap up to the break. 5 km to go: Petacchi is moving up. They'll have to catch the break if he's going to win. The break has 43 seconds. Grivko is still dangling in no man's land. 2 km to go: The lead is holding. The finish: Brut went first but Bertolini went by him. The others closed back up. Edvald Boasson Hagen (Columbia) then went for the sprint and easily takes the stage. 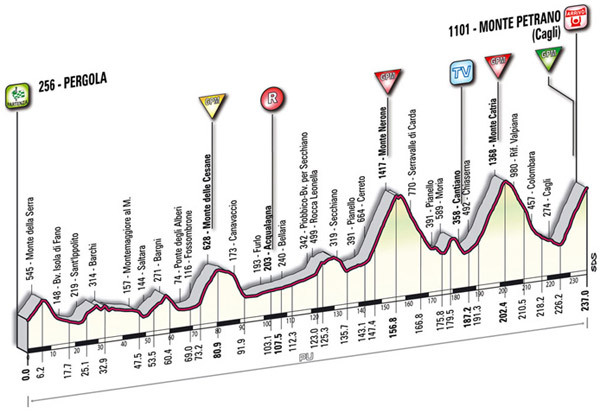 May 16, Saturday: Stage 8, Morbegno - Bergamo, 209 km. Mixed terrain. Weather in Bergamo: 72F (22C), partly cloudy, variable winds at 3 mph (5 kph). Forecast is for a 60% chance of occasional light rain. 4. Michael Rogers (Columbia) s.t. 5. Franco Pellizotti (Liquigas) s.t. 6. Stefano Garselli (Acqua & Sapone) s.t. 8. Jackson Rodriguez (Serramenti PVC-Diquigiovanni) s.t. 9. Marzio Bruseghin (Lampre) s.t. 10. Thomas Rohregger (Milram) s.t. 11. Joaquin Rodriguez (Caisse d'Epargne) s.t. 12. Filippo Pozzatto (Liquigas) s.t. 13. Yaroslav Popovich (Astana) s.t. 14. Tadej Valjavec (Ag2R) s.t. 15. Michele Scarponi (Serramenti PVC-Diquigiovanni) s.t. 16. Ivan Basso (Liquigas) s.t. 17. Arnold Jeannesson (Caisse d'Epargne) s.t. 18. Fredrik Kessiakoff (Fuji-Servetto) s.t. 19. Thomas Lovkvist (Columbia) s.t. 20. Kevin Seeldrayers (Quick step) s.t. 26. Levi Leipheimer (Astana) s.t. 27. Chris Horner (Astana) s.t. 30. Carlos Sastre (Cervelo) s.t. 31. Lance Armstrong (Astana) s.t. 34. Gilberto Simoni (Serramenti PVC-Diquigiovanni) s.t. Km 90, about 109 to go: The riders are descending the Forcella di Bura. A group of 10 riders are 3min 40sec ahead of the LPR-led pack. The break riders: Johann Tschopp, Dario Cataldo, Giovanni Visconti, Evgeni Petrov, Serge Pauwels, Carlos Ochoa, Jelle Venendert, Hector Gonzalez, David Lopez Garcia and Eduard Vorganov. I don't think any present GC concerns for the pack. Km 116: The break of 10 has a lead of 4min 12sec. LPR is still at the front, chugging away. 75 km to go: The lead is down to 3min. The average speed of the last hour of racing was 41.2 km/hr. Oh, the lead has come way down in the last couple of minutes. It's now about 2min. 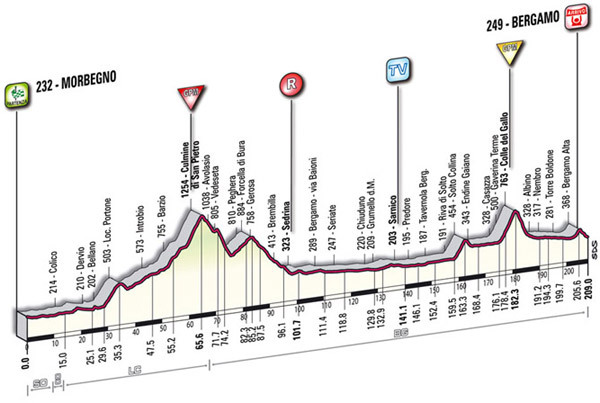 the race is on the Bergamo loop that includes the Colle del Gallo. See the map below. Lampre has been working the front very hard as of late. 68 km to go: The gap is down to 1min 52sec. Lampre has 5 guys at the front with LPR right behind. An intermediate sprint at Sarnico is coming up. 60 km to go: Lampre looks like it is doing a team time trial at the front of the peloton. They've kept the gap at about 1min 40sec. It looks like the break is work well together. The TV camera won't stay on the break long enough to see if anyone is missing his pulls, but it looks like everyone is doing his share. The break is currently going 46 km/hr while the peloton is racing at 53 km/hr. 53 km to go: On an unclassified climb, the Solto Collina, Dario Cataldo (Quick Step) has taken off. The break is coming apart and the field is only a minute back. Lampre is still chasing. Cataldo has been joined by Lopez-Garcia (Caisse d'Epargne) and Hector Gonzalez (Fuji). Evgeni Petrov (Katusha) joined the trio to make a 4-man break ahead of the remnants of the first break behind them and the pack at 1min 15sec. 40 km to go: Pauwels, Visconti Ochoa and Vorganov made it up to the front 4, making a break of 8. An intermediate sprint came and Visconti won it. the lead is stable at about 1min. 35 km to go: We are approaching the second-category 6-kilometer Colle del Gallo. Liquigas has moved to the front. Gap is 42sec. 30 km to go: Serge Pauwels (Cervelo) is a few seconds ahead of the break on the Colle del Gallo. Several riders including Horner, Garzelli and Cunego are within 10 seocnds of the break. More riders are close to the break. The break's lead is 22sec. Pauwels is caught and Garzelli is flying up the hill. Pellizotti is chasing now. Garzelli and Pellizotti have been caught by the break. Leipheimer, Boasson Hagen and Michael Rogers has bridged the gap. 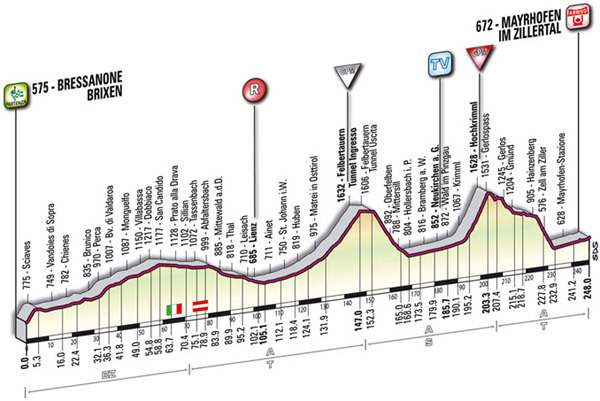 25 km to go: In the front: Garzelli, Horner, Arroyo Duran, Cunego, Pellizotti, Boasson Hagen, Pellizotti, and Rogers. Garzelli was first over the Colle del Gallo. LPR is leading the chase, trying to get back on terms with the break. The gap is 51sec. Michael Rogers is the virtual Maglia Rosa right now. What a race!! Basso is sitting right behind the LPR chasers. The break still has 52sec. This is a high-quality break of 8 extremely motivated racers. I'll bet catching them will be difficult if not imposible. 20 km to go: Well, I guess I'm wrong. The gap is down to 32sec. The riders in the break are taking very short pulls. It looks like a well-oiled machine. The gap has stabilized at 32sec. 16 km to go: The break has stopped working with arguments among them about who should pull. They are caught. Gruppo Compatto. 12 km to go: Siutsou (Columbia) takes off. He has a lead of 11sec. Now his lead has grown to 20sec. 8 km to go: As the pack rides up to Upper Bergamo (Bergamo Alto) Siutsou's lead is 30sec. The race will finish in the more modern Lower Bergamo. Liquigas is leading the pack over Bergamo's cobbles. 5 km to go: Siutsou is holding on to the brake levers, starting to rock a bit. He has 38sec. 4 km to go: Popovich attacks the pack near the top of the Bergamo climbs. Now Di Luca goes. The pack closes up. Siutsou goes by the 3km sign. He's got 20sec. The finish: Siutsou rides in front of huge crowds. He takes stage 8. Di luca remains the Maglia Rosa. 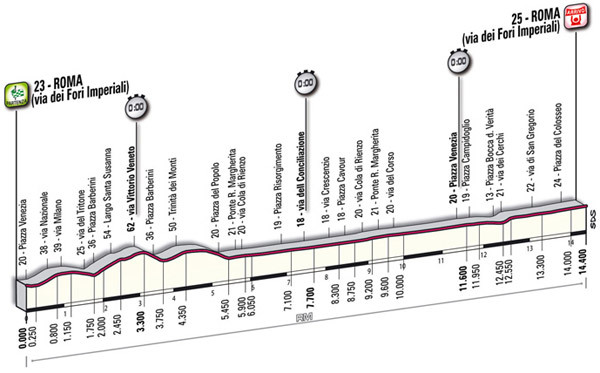 May 17, Sunday: Stage 9, Milano Show 100, 163 km. Flat circuit race. Weather in Milan at noon, local time: 73F (23C), partly cloudy with variable winds at 3mph (5kph). Forecast for the afternoon is for a high of 81F (27C) and a 60% chance of a thunderstorm in the afternoon. Note, the weather was terrific for the entire stage. Results: The stage was neutralized (see live updates below results). All riders were given the same time, none had their GC or any other standing changed with this stage. 4. Matthew Harleu Goss (Saxo) s.t. 5. Alessandro Petacchi (LPR) s.t. 6. Robert Forster (Milram) s.t. 7. Robert Hunter (Barloworld) s.t. 9. Said Haddou (Bouygues Telecom) s.t. 10. Thomas Fothen (Milram) s.t. 11. Eduard Vorganov (Xacobeo) s.t. 12. Ben Swift (Katusha) s.t. 13. Sebastien Hinault (Ag2R) s.t. 14. Ruggero Marzoli (Acqua & Sapone) s.t. 15. Jackson Rodriguez (Serramenti PVC-Diquigiovanni) s.t. 16. Dmytro Garbovsky (ISD) s.t. 17. Janez Brakovic (Astana) s.t. 18. Mark Renshaw (Columbia) s.t. 19. Jonas Ljungblad (Silence-Lotto) s.t. 20. Ian Stannard (ISD) s.t. 37. Michael Rogers (Columbia) s.t. 61. Damiano Cunego (Lampre) s.t. 64. Carlos Sastre (Cervelo) s.t. 67. Stefano Garzelli (Acqua & Sapone) s.t. 91. Ivan Basso (Liquigas) s.t. 104. Levi Leipheimer (Astana) s.t. 120. Danilo Di Luca (LPR) s.t. 157. chris Horner (Astana) s.t. 158. Lance Armstrong (Astana) s.t. 161. Denis Menchov (Rabobank) s.t. 165. Gilberto Simoni (Serramenti PVC-Diquigiovanni) s.t. All GC contenders finished safely. 190 finishers. GC after Stage 9: No change to any of the classifications. Km 45: The pack is together with LPR at the front. There haven't been any breakaways so far. The pack is riding at a leisurely 33 kph. 94 km to go: No one is trying for glory. Di Luca and Armstrong are at the front, chatting with teammates. Obviously the pack has decided to take it easy. 92 km to go: The pack has stopped at the finish line! Di Luca has taken a microphone. It seems like he is complaining about the safety of the course, but I am not sure. Now they are starting again. Because riders complained about the dangerous nature of today's Milan circuit, the organizers decided to neutralize the stage. It will not count for GC and the other various jerseys. Di Luca's speech was to apologize to the crowd for the slow speed, saying that the course was too dangerous to ride at high speed. 81 km to go: Still going slowly with LPR at the front. Mario Cipollini is at the stage and made some remarks critical of the riders' decision to strike. Looks like the speed is being lifted some. Maybe we'll have a race. 4 laps of the circuit to go: Nope. A couple of Katusha riders went to the front and it speeded up. Then LPR and Lampre suffocated things. Back to toodling along. Rumors are that not all the teams are happy with the slow-down. Other rumors are connecting Armstrong with the strike. If that's true, I wonder how happy Giro boss Zomagnan is after paying a (rumored) substantial sum to Armstrong to ride the Giro. The speed has come up a tad. We're up to 37 kph. Now it's 41 kph. 3 laps (43 km) to go: The speed is up to 43 kph. A Bouygues Telecom rider seems to be trying to lift the pace a bit. Now Garmin is driving hard. 51 KPH! The peloton is now a long string. 37 km to go: Armstrong and Di Luca are at the front, controlling the pack. The speed is mercifully higher, but there is no racing. There are no attacks. 30 km (2 laps) to go: The average speed of the race so far is 36.67 km/hr. Still no racing, but they are going fast. 22 km to go: It looks like there is a bit of fighting for postion as if the last lap is going to be raced. Micahel Barry of Columbia took a couple of hard pulls. No attempts to break away yet. 54 kph. 16 km to go, last lap: Still a high speed is maintained but I wouldn't call it a bike race. Astana, including Armstrong, have dropped off the back. Since the stage is neutralized, there will be no time penalty. 10 km to go: Now we're racing! Thomas Voeckler (Bouygues Telecom) is well off the front. He's good at this sort of thing. Voeckler is caught. 6 km to go: Garmin is at the front, 3 of them. Maybe this is Tyler Farrar's day. 4 km to go: Columbia is sitting right behind Garmin. It looks like the GC boys have dropped off. The Maglia Rosa group is 15 seconds behind the peloton with the sprinters. The finish: Boasson Hagen led the sprint out for teammate Mark Cavendish. Cavendish won the stage, which finished an hour behind schedule. Stage 9 Milan circuit race route map. 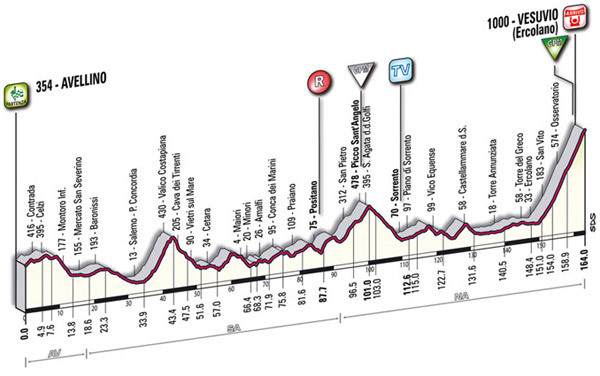 May 19, Tuesday: Stage 10, Cuneo - Pinerolo, 262 km. High mountains. Weather at Sestriere at 1:00 PM: Sunny, 62F (17C) with the wind from the west at 7 mph (10 kph). 4. Carlos Sastre (Cervelo) s.t. 7. Ivan Basso (Liquigas) s.t. 9. Joaquin Rodriguez (Caisse d'Epargne) s.t. 10. Michal Rogers (Columbia) s.t. 11. Stefano Garzelli (Acqua & Sapone) s.t. 12. Gilberto Simoni (Serramenti PVC-Diquigiovanni) s.t. 13. Lance Armstrong (Astana) s.t. 18. Damiano Cunego (Lampre) s.t. 19. Francesco Maschiarelli (Acqua & Sapone) s.t. 25. Chris Horner (Astana) s.t. Km 152: Stefano Garzelli went over Moncenisio alone with Juan Mauricio Soler chasing about a minute back. The peloton, which has shed a lot of riders is about 3min behind Garzelli. Descending Moncenisio: Soler has been caught by the peloton and Garzelli must be riding like his hair is on fire. He's still 3 minutes ahead of the pack. About Km 160: Garzelli's advantage has grown to 4min 50sec. Johan Bruyneel said some of the money owed to the Astana team has arrived from the Kazakh sponsors, but not enough to satisfy the balance owed. Km 180: Garzelli was first at the intermediate sprint at Oulx. We'll have to wait for a report on the time gap. We have it. The gap has come down to 4 minutes. Km 187: Garzelli has 4min 40sec as he climbs to Sestriere. Andriy Grivko and Giovanni Visconti (both ISD) are trying to get away but they've only been able to get 10sec on the pack. LPR is at the front of the peloton. 67 km to go: Garzelli is working hard with a pair of morons in shorts, helmets and goggles running alongside shouting what I assume is encouragement. Grivko and Visconti have started to close in on Garzelli, 2min 38sec behind him. Another break of 4 with Cardenas has also broken free of the peloton. Km 200, 1 km from the Sestriere summit: Garzelli has 6min 20sec on the Maglia Rosa group. He could do it!! Maglia Rosa group with all the contenders at 6min 25sec. Cardenas is sitting 17th in GC at 3min 3sec. I'm sure LPR will eventually sober up and go after him. Garzelli has taken the Green Climber's jersey with his 1st place at the top of Sestriere. The pack couldn't have been hammering the climb too hard. It's still quite large. Garzelli still looks smooth and strong. 37 km to go: Garzelli went through Fenestrelle, about halfway down the mountain. Grivko/Visconti are at 2min 28sec. The Cardenas group looks like its working very well together. Maglia Rosa group at 3min 30sec. LPR is at the front of the peloton with Liquigas and Astana right behind. Grivko/Visconti have closed to within about a minute of Garzelli. The peloton has caught the Cardenas group. 25 km to go: Garzelli waited for Grivko and Visconti. They are together now. The Maglia Rosa group is 1min 58sec behind the trio. We still have a climb at Pra Martino. 20 km to go: The lead trio still has it in the 150-inch gear, hammering away. Liquigas has taken over the lead of the 70-man peloton. The gap is 2min 3sec. Clearly the uniting of the ISD duo with Garzelli has helped the escapees' fortunes. The pack has stopped eating into their lead. We've just passed the 6-hour mark for the stage. Average speed for the stage so far is 40.596 kph. The Pra Martino climb has started for the breakaway. 15 km to go: Grivko has cracked. He can't keep up with the pace Garzelli is setting on the second category Pra Martino ascent. Visconti is still with him. Gap remains at 2min. 4 km left to climb. Liquigas continues to lead the chase. Basso is sitting in second place. Now the gap is 1min. Liquigas is throwing high heat. This is good for Basso and Leipheimer who prefer a steady fast pace rather than sharp jolts of speed. About 10 km to go: Pellizotti has broken away from the Maglia Rosa group. He has caught Garzelli and Garzelli is struggling to catch his wheel. The pack is about 20sec back. Garzelli and Visconti clawed their way up to Pellizotti. Di Luca has gone but Soler and Basso have closed the gap. Pellizotti is now alone off the front on the climb. 1 km from the summit: Garzelli has been caught by the pack. Armstrong has been gapped but is fighting to get back on. Pellizotti has only 12sec. Pellizotti went over with 8sec. A small group with Armstrong went over a few seconds after the Maglia Rosa group. He should catch back on quickly. Leipheimer is in the front chase with Basso and De Luca. This is a difficult descent on a tiny road. 7 km to go: Sastre is in the front group but Lovkvist has missed the move. Di Luca is a few meters ahead of the chasers and has almost caught Pellizotti. 5 km to go: We now have Sastre, Di Luca, Menchov, Pellizotti and Arroyo-Duran. Leipheimer, Basso and Soler are chasing 12sec back. 3km to go: Di Luca goes on the final short ascent. He's 10 seconds ahead. It's downhill from here. The finish: Di Luca hammered it home. The chasers, badly organized, couldn't close the gap. Di Luca got it just right as he wins the monster stage. Pellizotti takes second and then I think Menchov. 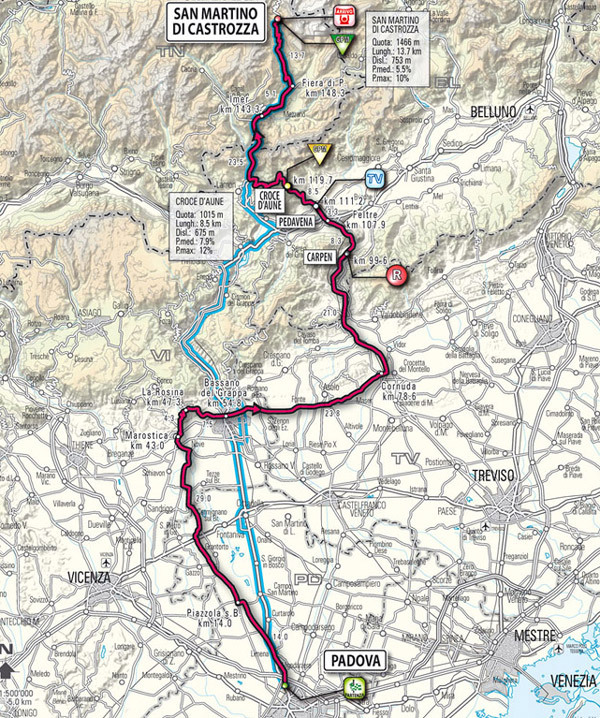 May 20, Wednesday: Stage 11, Torino - Arenzano (Genova), 214 km. Mixed terrain. Weather at Genoa at 12:30 local time: A nice day for a bike race. 72F (22C), breeze at 6mph (10kph) from the southwest and a forecast for abundant sunshine. 3. Alessandro Petacchi (LPR) s.t. 4. Allan Davis (Quick Step) s.t. 7. Edvald Boasson Hagen (Columbia) s.t. 8. Alexander Serov (Katusha) s.t. 9. Oscar Gatto (SD) s.t. 10. Robert Forster (Milram) s.t. 11. Ben Swift (Kausha) s.t. 12. Eduard Vorganov (Xacobeo) s.t. 13. Juan Jose Haedo (Saxo) s.t. 14. Thomas Fothen (Milram) s.t. 15. Francesco Gavazzi (Lampre) s.t. 16. Ruggero Marzoli (Acqua & Sapone) s.t. 17. Alessandro Donati (Acqua & Sapone) s.t. 18. Paolo Longo Borghini (Barloworld) s.t. 19. Jackson Rodriguez (Serramenti PVC- Diquigiovanni) s.t. 20. Marzio Bruseghin (Lampre) s.t. 37. Denis Menchov (Rabobank) s.t. 40. Michael Rogers (Columbia) s.t. 42. Damiano Cunego (Lampre) s.t. 46. Stefano Garzelli (Acqua & Sapone) s.t. 65. Levi Leipheimer (Astana) s.t. 71. Ivan Basso (Liquigas) s.t. 78. Danilo Di Luca (LPR) s.t. 82. Carlos Sastre (Cervelo) s.t. 86. Lance Armstrong (Astana) s.t. Km 28: Gazzetta dello Sport reports that of the 188 starters for today's stage, Chris Horner (Astana) was not among them. Horner tore a leg muscle when he crashed in stage 10. Km 118: Levi Leipheimer crashed but was up and quickly got a new bike and rejoined the pack. The peloton is together with the exception of a lone breakaway rider, Xacobeo rider Vladimir Isaichev. Isaichev has a lead of 1min 5sec. Km 123: Isaichev has a good lead, 6min 5sec. Oops, it now 6min 50sec. Km 130: The average speed for the third hour was 45.20 kph. Isaichev has a lead of 8min. Garmin and Milram riders are at the front of the pack. Isaichev is no GC threat, being down about 2 hours. Km 146, about 70 to go: The lead is down to 7min 30sec as the race passes thorugh Novi Ligure. Quick Step is helping with the chase. The chase seems to be getting a little more serious. Isaichev is riding at 49 kph and the pack is traveling at 53 kph. The gap is now 5min 52sec. The pack is starting to string out. Km 155, about 51 to go: Average speed of the race so far is 43.87 kph. Gap is at 4min 55sec. Chapette's law says he'll get caught close to the end: in the closing stages of a race a determined peloton will chase down a break and close in at the rate of 1 minute per 10 kilometers traveled. Km 170, 46 km to go: The efforts of Milram and Quick Step (mostly Milram right now) are starting to pay off. The gap is 3min 15sec. Milram has had a quiet Giro and is probably trying to set things up for their Robert Forster. The GC riders will be hoping for the easiest possible ride today with the giant 61.7km individual time trial coming tomorrow. Gap is down to 2min 40sec. The road will rise for the next 25km culminating in the Passo del Turchino. Edvald Boasson Hagen took second place in the Ovado intermediate sprint, Isaichev having taken first place. Leaving Ovado the gap is 2min 2sec. Isaichev is really laboring now as the rode rises. He looks pretty cooked. I guess about kilometer 180, 36 to go: Gap is down to 46sec. LPR is at the front of the rising road, making sure no one gets any foolish ideas about taking off and making Di Luca chase. Is Di Luca planing something for the Turchino. Marco Marzano (Lampre) has taken off after Isaichev. 35 km to go: Marzano has caught Isaichev and then dropped him. Armstrong and Leipheimer are sitting right behind LPR, which is leading the peloton. Average speed of the race so far is 43.631 kph. Isaichev has been caught and Marzano continues his lone ride off the front. Now Marcos Garcia (Xacobeo) has launched himself. Di Luca has put on his sunglasses and adjusted them to perfection. He looks good, una bella figura! 30 km to go: Marzano has 50sec on the pack. Garcia is 29sec behind him. Average speed of the race so far, 44 kph. LPR is still working away at the front of the pack. 25 km to go: Marzano has 20sec. Garcia was absorbed by the peloton. We're about to start the Turchino. Looks like everyone is in the little ring. The pack just passed the road sign with the turn to the Turchino. Marzano is in sight with less than 10sec. He's caught. Astana has gone to the front. Probably to keep a high, steady pace to protect Leipheimer from suden accelerations, which Leipheimer doesn't handle well. 20 km to go: The front of the peloton as the Turchino is ascended looks like an Astana team time trial. Di Luca is right there with the Astana riders. So is Garzelli. Garzelli takes off to get the KOM points. Armstrong was second and Leipheimer was third over the top of the Turchino. 16 km to go: Astana is leading the descent. Armstrong is leading the pack at 63 kph. Looks like Leipheimer is right with him. So is Di Luca. 10 km to go: Armstrong is really stringing things out. He's got it in the 150-inch gear and flying down the hill. Filippo Pozatto, who crashed earlier, is off the back. Basso looks to be up near the front. 8 km to go: Armstrong eased and now Cunego took the front. It's a little less organized up front now. Popovych has taken off. Gasparotto has caught him and the 2 have about 7 seconds. They're caught. I don't think the sprinters want to let this one get away. 5 km to go: They are on the coast and all together. 3 km to go: Columbia has moved to the front for Cavendish. 2 km to go: Gasparotto tries again, now Ermeti goes. The finish: All together. Columbia took control and released Cavendish. No one could come around the British speedster. It was a pretty dominating performance. Cavendish wins the stage and Di Luca remains in pink. 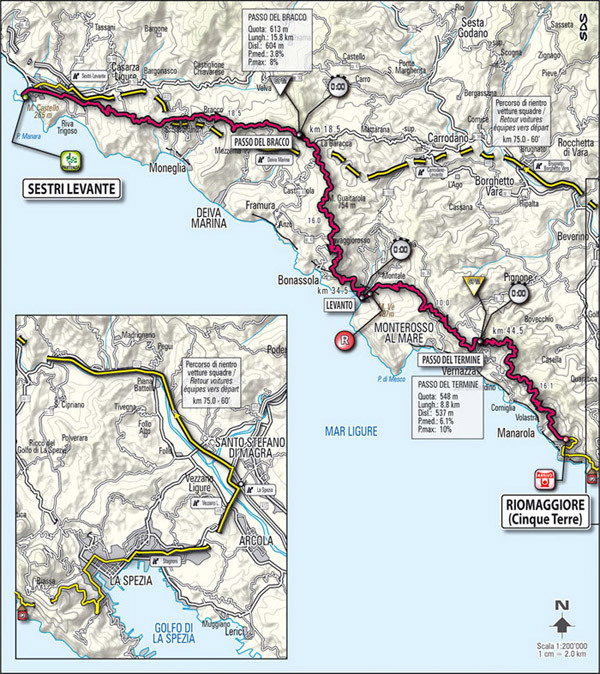 May 21, Thursday: Stage 12, Sestri Levante - Riomaggiore (Cinque Terre), 60.6 km. Individual time trial over mixed terrain. Weather in nearby La Spezia at 1:00 PM local time: 81F (27C), Mostly sunny with the wind from the southwest at 3 mph (5 kph). As the afternoon progresses that could increase to 15mph (22 kph). 11. Ivan Basso (Liquigas) s.t. 10:05 AM Eastern Time: Third check point at 44.5 kilometers. Menchov has set an incendiary pace, taking 34 seconds out of Leipheimer. Di Luca went through 1min 46sec slower than Menchov. Menchov is the virtual Maglia Rosa. 10:40 AM Eastern USA time: All have gone through the second check point at km 34.5. 10:25 AM Eastern USA time: All the riders have gone through the first check point at 18.6 km. Di Luca is doing better than one would have thought. Rogers is doing a poorer ride than one would have expected of a time trial specialist. 9:40 AM Eastern: With a few of the top dogs still to start, Gabriele Boisisio (LPR) has the best time at the first check point. Armstrong was 6th, 43 seconds slower. 9:28 AM Eastern: There were a lot of questions as to what kind of equipment the riders were going to use on this undulating, curvy time trial course. Armstrong looks like he is using a normal road rig with time trial clip-ons. Rims looks like they are about 40-mm deep. He's using his normal road racing helmet, not an aero one. He's climbing the first hill with a supple, high-cadence pedal stroke that looks familiar. I don't even see any clip-ons on Lovkvist's bike, but he is wearng an aero helmet. 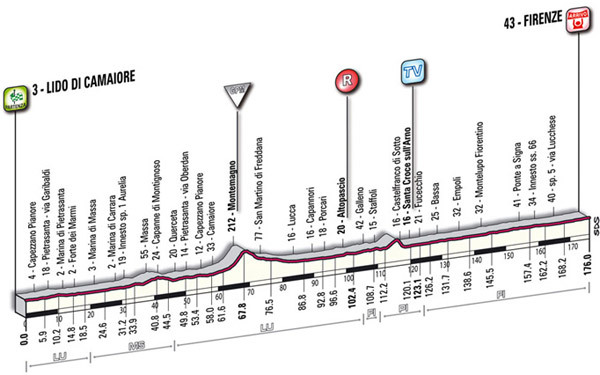 May 22, Friday: Stage 13, Lido di Camaiore - Firenze, 176 km. Flat stage. Weather in Florence at 1:00 PM local time: 81F (27C), some clouds with the wind from WSW at 5 mph (11 kph). It should climb to 88F (31C) as the day progresses. 2. Alessandro Petacchi (LPR) s.t. 6. Juan Jose Haedo (Saxo) s.t. 8. Ben Swift (Katusha) s.t. 9. Davide Vigano (Fuji-Servetto) s.t. 11. Mark Renshaw (Columbia) s.t. 12. Filippo Pozzato (Katusha) s.t. 13. Eduard Vorganov (Xacobeo) s.t. 14. Dmytro Grabovsky (ISD) s.t. 15. Ruggero Marzoli (Acqua & Sapone) s.t. 16. Said Haddou (Bouygues Telecom) s.t. 17. Alexander Serov (Katusha) s.t. 19. Matteo Montaguti (LPR) s.t. 20. Jackson Rodriguez (Serramenti PVC-Diquigiovanni) s.t. Km 40: The day's break seems to have been established. At km 12 Leonardo Scarselli (ISD), Bjorn Schroder (Milram) and Mikhail Ignatiev (Katusha) got away. All 3 are over 2 hours down on GC. They currently have a lead of 3min 50sec. The average speed for the first hour was 46.10 kph. Mark Cavendish and Yohann Gene crashed but both were up and back in the peloton shortly thereafter. Km 70: Over the third-category Montemagno the break's lead is 4min 45sec. Km 77: Passing through San Martino and closing in on Lucca the gap is growing, now 5min 20sec. Km 86: As the riders pass Lucca the gap is back down to 4min 50sec. The average speed for the second hour is 44.90 kph. Km 90, 85 km to go: As the pack goes through Capannori, Garmin and Columbia are at the front of the peloton, looking after their chances for a sprint finish in Florence. Rabobank is right behind them with Menchov, happy to let the other teams keep things together. Now the gap is 3min 40sec. As the riders passed through Altopascio they picked up their food musettes. As a result of the slowdown for the feed zone the gap grew to over 4min. 67 km to go: Food stowed, Columbia and Garmin are back at the front of the peloton chasing the break. Gap is 4min 15sec. All 3 of the break riders are taking their turns at the front, taking short pulls. 53 km to go: The race is about to cross the Arno river at Santa Croce sull'Arno. The gap is 4min 5sec. 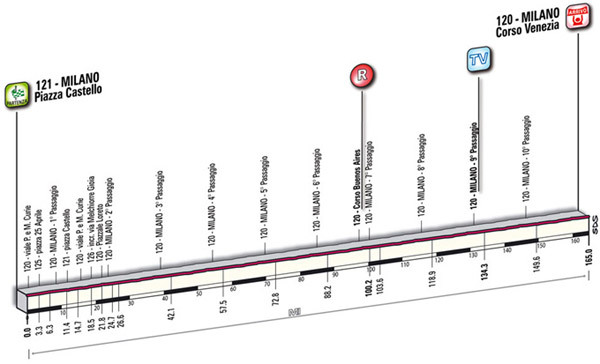 There was an intermediate sprint at Santa Croce which Scarselli took in an uncontested roll-through. Gap is 3min 44sec. The break is traveling at 51kph and the pack is chasing at 53kph. Since this might be the last real chance for a big field sprint I am sure the sprinters' team will do all they can to make sure it's all together in Florence. Around 40 km to go: Gap is down to 3min 15sec. Still Columbia and Garmin at the front of the pack. 37 km to go: Through Empoli the gap is 2min 40sec. The peloton is clearly managing the gap so that they catch the break near the finish. They've been closing in at 1 minute per 15 kilometers traveled. 30 km to go: Bjorn Schroder has left his 2 breakaway companions. Time gap to the peloton is 1min 40sec at Montelupo Fiorentino. 25 km to go: The gap to Schroder (Milram) is still 1min 45sec. Ignatiev and Scarselli are close to being caught. 20 km to go: Through Ponte a Signa. Ignatiev and Scarselli are caught while Schroder is still hanging tough at 1min 41sec. 10 km to go: Bjorn Schroder is not giving up. Gap is 1min 14sec. 5 km to go: In the city of Florence. The pack is going 9 kph faster than Schroder. The riders in the pack are elbowing each other for position. Armstrong is taking a pull at the front of the pack. Schroder is caught. We're set for a big sprint finish. 3 km to go: All together and moving really fast. Garmin at the front. The finish: Garmin at the front at the beginning of the last kilometer. Boasson Hagen gave a perfect lead out to Cavendish. Petacchi tried to come by, but just couldn't. Cavendish wins another one. 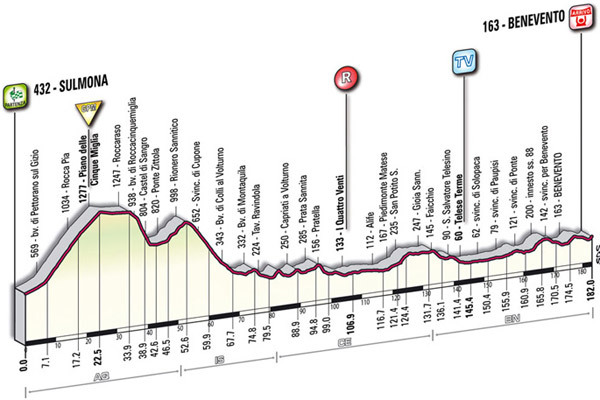 May 23, Saturday: Stage 14, Campo Bisenzio - Bologna (San Luca), 172 km. Weather at Bologna at 12:20 PM, Local time: 82F (28C), mostly cloudy with variable winds at 2 mph (3 kph). Forecast is for sunshine later in the day and a high of 89F (32C). 10. Franco Pellizotti (Liquigas) s.t. 11. Danilo Di Luca (LPR) s.t. 12. Stefano Garzelli (Acqua & Sapone) s.t. 14. Carlos Sastre (Cervelo) s.t. 17. Levi Leipheimer (Astana) s.t. 18. Michele Scarponi (Serramenti PVC-Diquigiovanni) s.t. Km 24: 181 riders deaprted from Campo Bisenzio at 12:41 local time. Not starting today: Steve Chainel (Bouygues Telecom), Cameron Meyer (Garmin), Mark Cavendish and his leadout man Mark Renshaw (Both Columbia) as well as crash victim Filippo Pozzato (Katusha). Cavendish didn't see any more chances for mass sprints in the remaining stages. Moreover, he wanted to be fresh for the Tour de France, his next goal. There are 14 riders away on the Passo della Collina. They have 4min 35sec. The closest thing to a GC threat in the break is Barloworld rider Christopher Froome, over 14min down. Km 72: Near the summit of the second category Valico di Mediano the 14 fugitives are still away. Their lead is 3min 50sec. The average speed for the second hour was 38.80 kph. Km 82: On the way down the Mediano through Pietrcolora the gap is 3min 42sec. LPR is leading the peloton. Obviously the very hard ascent at the end of the stage is in their minds because it suits Di Luca to a "T". Menchov is gong to have his hands full today. Km 97: Ian Stannard (ISD), who had crashed earlier, has rejoined the peloton. The gap to the break is now 3min 37sec. Km 102: The break has gone through the feed zone and picked up a little chow. LPR still leads the pack. Now the peloton gets its musettes. Gap remains 3min 30sec. Gap has stretched out to 4min. Km 115, 57 km to go: The 13 breakaways went over almost together, but the gaps closed up on the descent. In the break Andriy Grivko and Giovanni Visconti have been doing the lion's share of the work. The pack went over the top 4min 39sec after the break. Here's the break: Christopher Froome (Barloworld), Vasili Kiryienka (Caisse d'Epargne), Francsco Gavazzi (Lampre), Franesco Reda (Quick Step), Rubens Bertogliati (Serramenti PVC), Evgeni Petrov (Katusha), Eduard Vorganov (Xacobeo), Simon Gerrans (Cervelo), Guillame Bonnafond (Ag2R), Giampaolo Cheula (Barloworld), Philip Deignan (Cervelo), Giovanni Visconti (ISD), Andriy Grivko (ISD). 35 km to go: Average speed for the race so far is 39.993 Kph. Gap is 3min 52sec as the riders continue to descend. LPR is hammering away. If Di Luca is going to win this Giro, he has to keep batting away, getting seconds here and there because there is still the time trial in Rome, which plays to Leipheimer and Menchov. Di Luca has to be hunting the 20 seconds time bonus for winning the stage. Rabobank seems very uninterested in helping him with that project. They seem content to leave the break out there, sweeping up the bonuses. Km 30: Gap is 2min 54sec. Chapette's Law says they'll get caught close to the end. The race is on the Mongardino climb. Still LPR at the front of the chasing pack. 25 km to go: Liquigas seems to be moving up to the front of the peloton but doesn't show any signs of wanting to do any work yet. The gap has come down to 1min 48sec. Up in the break Cervelo Rider Philipe Deignan has taken off but he's not getting much of a gap. He'll probobly get the KOM points then let himself get caught. He's getting caught before the top. Cheula and Visconti have been dropped by the break. Di Luca has moved up to second place in the peloton. Menchov has moved up behind him with a Rabobank helper. 16 km to go: At the Pontecchio Marconi intermediate sprint. Kiryienka took the uncontested sprint. The break still has a nice rotating pace line. Vorganov is having trouble with the break's high speed. After a day of pounding in the heat the LPR guys look pretty grim-faced. Gap is down to 58sec. Now Acqua & Sapone and Rabobank have joined in the chase. 7 km to go: 2min. Lots of action in the peloton with GC teams looking for a position near the front. 5 km to go: Grivko takes off from the break. He still has the San Carlo climb in front of him. Liquigas is driving the peloton. 3 km to go: Grivko has 6sec. The race is in Bologna. 2 km to go: Grivko has been caught by the break. The break and the pack are both on the San Carlo. The finish: This is steep. Simon Gerrans (Cervelo) opened up a huge gap with Christphoer Froome (Barloworld) and takes a clean win. Di Luca led Garzelli, Pellizotti and Menchov up the hill. Then there was some regrouping. Looks like Pellizotti took the field sprint. Menchov was with Di Luca. Simon Gerrans takes the stage. 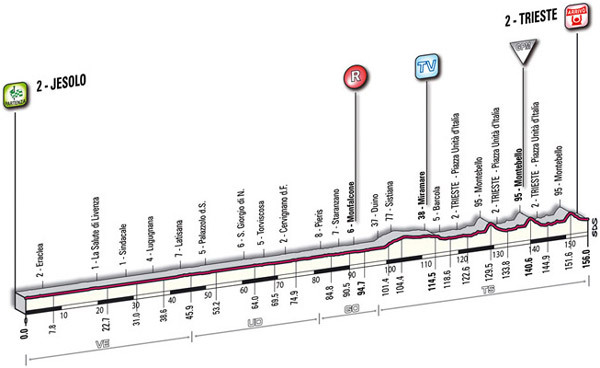 May 24, Sunday: Stage 15, Forli - Faenza, 161 km. Mixed terrain. Weather in nearby Imola at 1:00 PM local time: 90F (32C), wind from the NNE at 6mph (10 kph). 3. Marco Pinotti (Columbia) s.t. 4. Lars Ytting Bak (Saxo) s.t. 9. Eduard Vorganov (Xacobeo) s.t. 11. Thomas Lovkvist (Columbia) s.t. 12. Marzio Bruseghin (Lampre) s.t. 13. David Arroyo Duran (Caisse d'Epargne) s.t. 14. Danilo Di Luca (LPR) s.t. 15. Michael Rogers (Columbia) s.t. 17. Stefano Garzelli (Acqua & Sapone) s.t. 18. Ivan Basso (Liquigas) s.t. 20. Jose Rudolfo Serpa (Serramenti PVC-Diquigiovanni) s.t. 21. Franco Pellizotti (Liquigas) s.t. 22. Carlos Sastre (Cervelo) s.t. 27. Damiano Cunego (Lampre) s.t. Km 5: 178 riders started in Forli today. Tyler Farrar (Garmin-Slipstream) and Eros Capecchi (Fuji-Servetto) didn't start. Break attempts are going almost from the gun. Jens Voigt and Dries Devenyns are having a go right now. After Di Luca failed to put a dent in Menchov's armor yesterday in a stage that was perfectly suited to Di Luca's abilities, Di Luca vowed that this race is not over. He was a bit hot under the collar over the fact that his LPR team had to do all the chasing yesterday. He asked where Liquigas had been, since they had vowed to attack. I'm sure Liquigas was quite happy to let LPR use themselves up. Menchov's Rabobanks must have been grateful for the gift of having another team control the race while they sat on. All of today's climbs are rated second and third category. 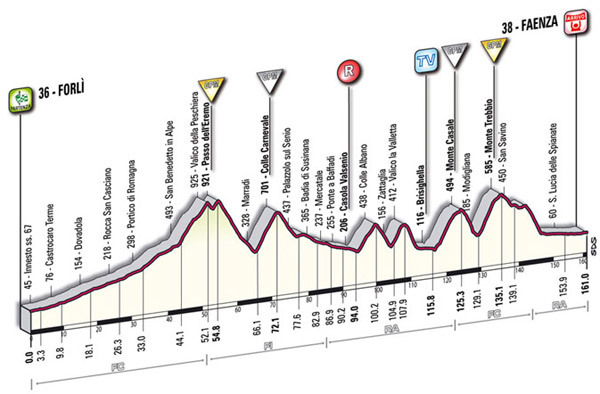 By the way, in the Giro there is no Hors Category climb. The hardest climbs are rated category 1. So the two category 2 climbs in today's stage, the Eremo (first climb) and Trebbio (last climb), would be roughly the same as Tour de France cat 1 ascents. Km 24: Voigt and Devenyns have been caught. Km 55: A group of 16 riders went clear at km 27. They have gone over the second category Passo dell'Eremo 3min 26sec ahead of the pack. Today Rabobank is taking up the duties of working at the front of the peloton. Km 66: The break has gone through Marradi 3min 40sec ahead of the pack. The riders are unzipping their jerseys in the oven-like temperatures the day has brought. Km 72: The break went over the third category Carnevale with 4min 40sec. Rabobank still at the front of the peloton and seemingly unworried about the break. It certainly poses no threat to Menchov. With nearly all the teams represented in the break, I can't expect Rabobank to get much help today. In the break, a lot of the usual suspects: Jose Serpa (best placed rider in the break, I think, at about 10min), Leonardo Bertagnolli (both Serramenti), Lars Ytting Bak (Saxo), Andriy Grivko (ISD) Pablo Lastras Garcia (Caisse d'Epargne), Marco Pinotti (Columbia), Daniel Navarro (Astana),Eduar Vorganov (Xacobeo), Marco Manzano (Lampre), Serge Pauwels (Cervelo), Nikita Eskov (Katusha), Gorazd Stangelj (Liquigas), Mauro Facci (Quick step), Alessandro Donati (Acqua & Sapone), Hector Gonzalez (Fuji) and Matteo Montaguti (LPR). Average speed so far, 37.8 kph. Km 86, 75 km to go: Lead is 5min 5sec. Looks like Di Luca had a mechanical, but he's back up in the pack. 67 km to go: Everyone has passed thorugh the feed zone. Gap is 4min 10sec. Km 100, 61 to go: The gap is out to 5min 26sec. The average speed for the race so far is 38.806 kph. 53 km to go: At Valico La Valletta with the break descending and the peloton climbing, the gap is up to 6min 20sec. While Rabobank was leading up the climb the peloton was rather compact. Rabobank isn't investing too much energy in this chase. Liquigas looks like it has had it with the slow pursuit and has moved to the front and started to work. Menchov jumped ahead to near the front to keep an eye on the Liquigas team in case they had any mischief in mind. 45 km to go: Oh my!! When Liquigas dropped the hammer, the peloton split. Wonder who was caught napping at the back? Menchov is there and there are some Astana jerseys. Gap to Maglia Rosa group is 4min 58sec. 35 km to go: On the Monte Casale ascent. Basso, Pellizotti, Leipheimer, Armstrong, Garzelli, Di Luca are in the front chasing group, for sure.The gap to the second peloton is at least a half-minute. Bam!!! Basso takes off and Garzelli and Sastre go after him. Garzelli gets his wheel. Garzelli is leading Basso now. Sastre is slowly closing in on the pair. No, it's not Sastre, it's another Cervelo rider chasing Garzelli and Basso. An LPR rider is leading Di Luca with Leipheimer on his wheel. At the crest of the Casale: A reduced break without Grivko, among others head down the hill. Basso and Garzelli have formed a perfectly working pair and are picking up and dropping riders from the break. They go over 2min 19sec after the front of the break. The Maglia Rosa group goes over at 3 minutes after the front of the break, 40 seconds behind Basso and Garzelli. Hoo Ha! The race is in play. Garzelli is a good descender, he should be able to get Basso, who is not a good descender, off the hill in good time. Di Luca also is a superb descender. Garzelli is indeed leading Basso on the descent. A Liquigas breakaway rider, Stangelj has waited for Basso. Now we'll have the tough Monte Trebbio ascent. 30 km to go: Stangelj turned himself inside out helping on the approach to Monte Trebbio and as soon as the ascent strted, he was dropped. Basso is leading Garzelli now and both still look smooth. LPR rider Spezialetti is still doing all the work to lead the Maglia Rosa group. Lovkvist has made it up to the Maglia Rosa group after missing the split. 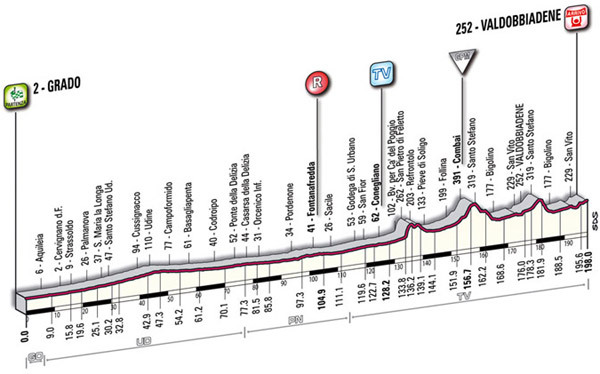 Gaps: Front of break then Basso and Garzelli at 1min 58sec then the Maglia Rosa group at 3min 7sec. Basso and Garzelli therefore have a lead of 1min 9sec on the the Menchov group. 26 km to go: The crest of Monte Trebbio, the last climb of the day: The break has shattered and now it's Pauwels and Bertagnolli at the very front. Garzelli and Basso (both former Giro winners) with Grivko and Serpa go over 2min 13sec. Di Luca goes and Menchov closes up immediately. They go over at 3min 15sec. There is still about a minute between Basso and Di Luca/Menchov. 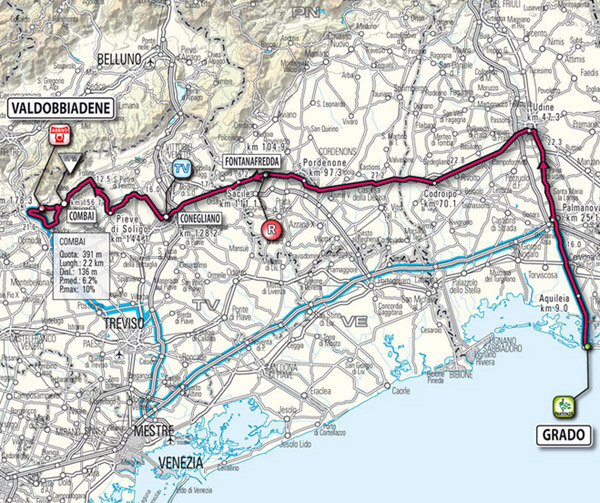 20 km to go: Pauwels/Bertagnolli then Basso/Garzelli at 2min 11sec and the Maglia Rosa group at 2min 49sec. Menchov and company are closing the gap to Basso. It's now 38sec. 15 km to go: Basso has 19sec on the Menchov group. The Menchov group has grown and looks like all the better riders are in it. Basso and Garzelli are sitting up and waiting for the Maglia Rosa group. They are caught. Leonardo Bertagnolli is alone out in front now. 10 km to go: Bertagnolli goes through 2min 5sec ahead of the Maglia Rosa group. A bit behind them is a foursome with Armstrong, Popovych, Cunego and Donati. 5 km to go: Bertagnolli has Lars Ytting Bak, Pauwels, Marzano and Pinotti about a half-minute behind him. 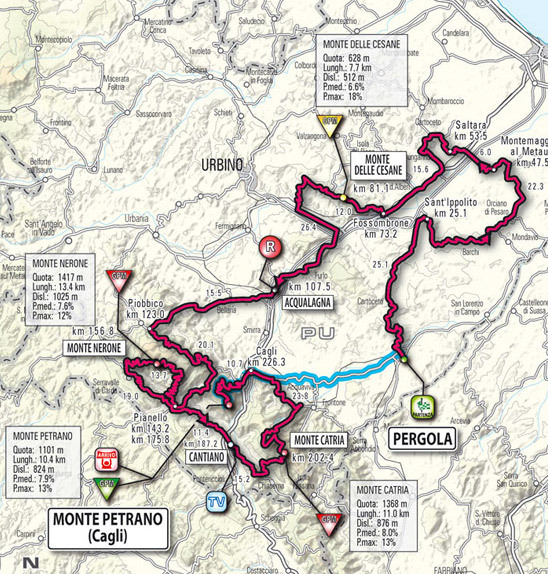 May 25, Monday: Stage 16, Pergola - Monte Petrano, 237 km. Mixed terrain with a hilltop finish. Weather in nearby San Marino at 1:00 PM local time: Hot! 90F (32C), sunny skies with variable winds at 3 mph (5 kph). 11. Levi Leipheimer (Astana) s.t. 12. David Arroyo Duran (Caisse d'Epargne) s.t. 16. Kevin Seeldrayers (Quick Step) s.t. Roughly km 100, at the town of Furlo: There is a group of 18 riders off the front with a gap of 7min 55sec. Some of them are formidible: Damiano Cunego, Yaroslav Popovych, Michele Scarponi, Gabriele Bosisio, Jens Voigt, Pavel Brutt, Kjell Carlstrom. This is a hard stage in the hills of Le Marche. Several riders have predicted an explosive stage as this is an important chance to take time from Menchov and Di Luca, if this can be done. Astana, Liquigas, LPR and Rabobank have riders in the break who will be able to help their captains if Menchov, Basso, Di Luca and Leipheimer need them to wait to give help. Cervelo missed this move and Sastre won't have this advantage. Belgians are unhappy with the Cervelo team after yesterday. Belgian rider Serge Pauwels was in the winning break with Bertagnolli. Near the end Pauwels was told to wait for Cervelo team leader Sastre beacuse Basso was rampaging down the road and Sastre needed help. Almost immediately after Pauwels sat up Basso was caught and Bertagnolli took a stage that Pauwels might very well have won. Km 112, 125 to go: The gap is 6min 30sec. The average speed for the third hour was 37.80 kph. The fastest average speed projected by the organizers was 38 kph for this stage and La Gazzetta dello Sport says we're ahead of that schedule. Rabobank is doing its duty and riding at the front of the peloton. 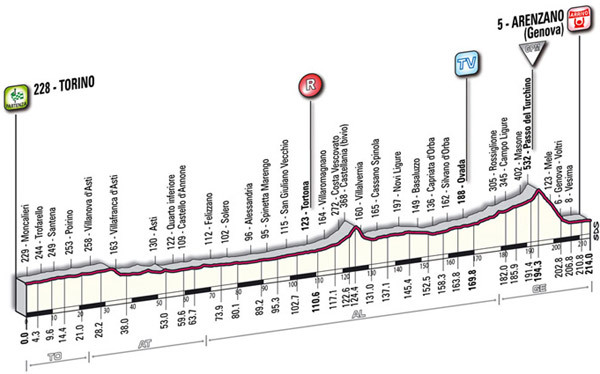 Km 136, 101km to go: The break is descending into Secchiano. The next stop is Monte Nerone, rated as a first category climb (remember in the Giro this is the hardest rating, there is no Hors Category) and will be crested at km 157. Gap is 7min 20sec. Michele Scarponi, who crashed earlier, gets a new bike and a new jersey. Km 147, 89 km to go: The break is on the Monte Nerone ascent. The day's average speed has slowed to 36.10 kph. The gap is 5min 45sec. Rabobank has 2 riders at the front of the peloton. The break has started to shed riders. Serramenti riders De Bonis and Scarponi are leading the break with Popovych sitting in third. 88 km to go: The Nerone road is very narrow with rough pavement The gap is stable, still 5min 48sec. Menchov is sitting in third place in the peloton, just behind his 2 domestiques. The GC contenders are close by. The peloton is still rather compact. The break is climbing at 19 kph and the peloton is going 21 kph. 83 km to go: The Serramenti rides are still driving the break. Back in the peloton Menchov has Di Luca for a shadow. Basso is riding next to Di Luca. The gap is 5min 20sec. Average speed for the race so far is 34.311 kph. It is hot! The riders are constantly drinking and pouring water on their heads, trying to get a little relief. 80 km to go: The gap to the peloton is 3min 42sec. A little bit after the summit the road down is a lot nicer than the road up. It's freshly paved and wide enough for a center line. Still 2 more climbs to go, Monte Catria and Monte Petrano. Maarten Tjallingii was one of the 2 Rabobank riders in the break. He had been dropped earler. He picked up a lot of water bottles while waiting for the peloton and handed them out to his teammates at the crest of the Nerone. I think Rabobank still has Ardila in the break. Yes, he's there. I just saw him sitting on the back. He won't be doing any work, especially with Cunego in the break. The road may be in good condition, but it is very twisty. Rabobank leads the peloton on the way down. 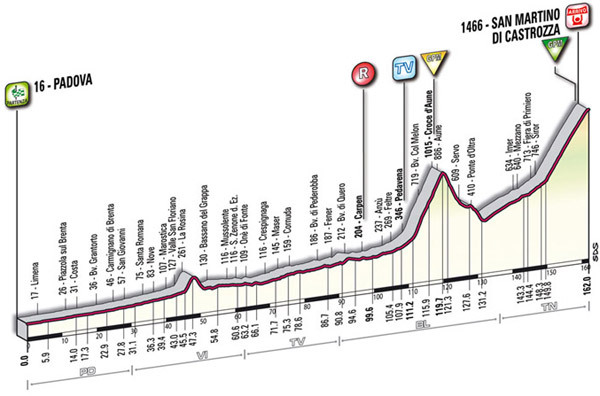 70m km to go: The break went through Serravale di Carda, about halfway down the mountain. The peloton is much smaller after that climb. I can't tell how many are left, maybe 60 riders. It will grow as riders take terrible chances to regain the bunch on the descent. Gap is 3min 55sec. The race just went over the 5-hour mark and the hardest part is still to come. 59 km to go: In the break, De Bonis still leads with Scarponi right behind him. then comes Jens Voigt and Damiano Cunego. They are on the short ascent to Moria. Scarponi has applied some pressure and Cunego goes with him. A good gap is quickly established. Popovych (Astana) and Bosisio (LPR) are chasing Scarponi and Cunego. The gap between the 2 pairs is 8 seconds. In the peloton Liquigas is moving to the front. Rabobank has taken the lead of the peloton again. News just came that Barloworld rider Juan Mauricio Soler has abandoned. 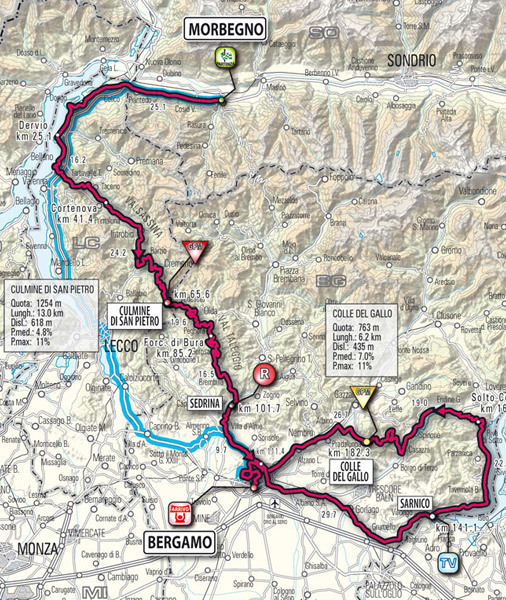 52 km to go: Popovych and Bosisio have caught Cunego and Scarponi. 50 km to go: The lead 4 have gone through Catiano and are beginning the Monte Catria ascent. It averages 8% but has a patch of 13%. The gap from the 4 to the peloton is 5min 26sec. The peloton is strung out into a long line. Cunego is 9min 43sec down on GC. Scarponi looks really hot and really tired but he still has a good smooth pedal stroke. Cunego looks good. In the front : Popovych, Cunego, Bosisio and Scaponi. 1min 28sec back: The remainder of the original break, Dion, Bellotti, Jeannesson, Gomez-Gomez, Carlstrom, Cataldo, Ardila, De Bonis and Voigt. The Maglia Rosa group is 4min 44sec behind the Cunego group. 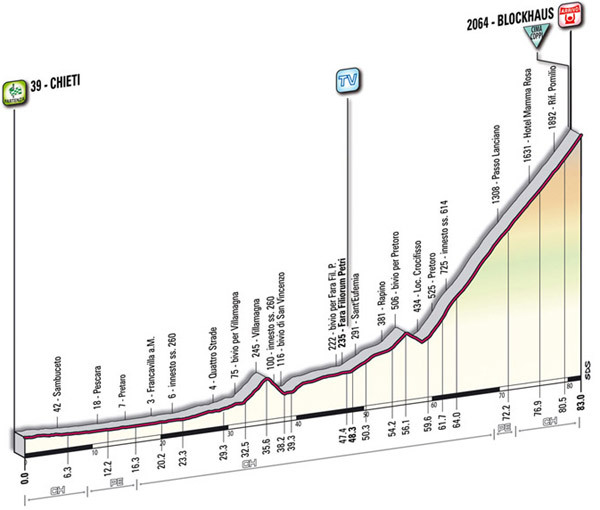 45 km to go, on the Catria ascent: Cunego accelerated and Scarponi couldn't take it. He's dropped. Now he's clawing his way back. It looks like Thomas Lovkvist (White Jersey) has been dropped from the Maglia Rosa group. Simoni is in trouble. He's dropped. 37 km to go: Cunego and Bosisio look the best in the break. The Maglia Rosa group looks like about 25-30 riders strong. Popovych goes and Cunego and Boisisio immediately close up. Scarponi is cooked and can't respond. It's now 3 in front. Kjell Carlstrom (Liquigas) is making a bid to get to the lead trio. He has passed Scarponi and is 33sec behind the trio. Near the top of Monte Catria Cunego attacks and take Bosisio with him. Popovych is dropped but is not giving up. 34 km to go: Over the top of Monte Catria, the lead trio went over together with Carlstom crossing about 90 seconds later. At the crest Scarponi is caught by the Maglia Rosa group which went over 3min 12sec after the Cunego group. Now a fast descent and the ride to the top of Monte Petrano. 30 km to go: Popovych has put it in the 150-inch gear on the descent and has opened up a 12sec gap on Cunego and Bosisio. He's going 73 kph. He'll need that gap for the ascent, he was showing real weakness on the Catria climb. 25 km to go: Popovych is hauling, smoothly taking the turns in the descent. 13sec now. Leipheimer has a mechanical!!! He's stopped. Bad time. He's back up and chasing after a puncture. Popovych has 2min 48sec on the Maglia Rosa group. Leipheimer has several teammates to help with the chase back to the Maglia Rosa group. 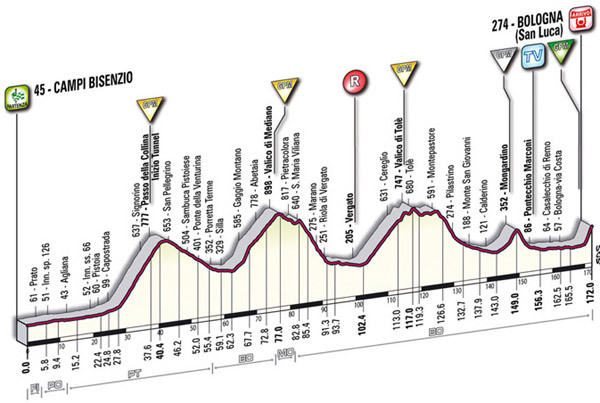 20 km to go, 10 km before the start of the climb: Cunego has dropped Bosisio who seems to have had a mechanical. Leipheimer seems to be on the back of the Maglia Rosa group. The gap from Popovych to the Maglia Rosa group was 4min 42sec. Rabobank seems to have taken their collective feet off the gas, probably a sportsmanlike move to let Leipheimer get back on. 15 km to go: Popovych went through abut a half-minute ahead of Cunego. All the major GC contenders are with Menchov. The Maglia Rosa group is 5min behind Popovych. 11 km to go: Popovych has just gone through Cagli 18 seconds ahead of Cunego. 10 km to go: Menchov has a last snack before the ascent starts. When will the first blow be struck and who will deliver it? Liquigas has hit the front hard. Cervelo rider Simon Gerrans goes to the front and ups the pace still more. Basso is at the front for a moment. Sastre is well back. Armstrong and Leipheimer are very close to the front but not making any moves yet. Bam!! Basso goes with Menchov, Garzelli and Di Luca on his wheel. Leipheimer can't go with the move. Armstrong has closed up to the Basso group. Sastre gets up to them and goes right to the front. Armstrong is dropped. 8 km to go: Di Luca hits hard and Menchov closes. Sastre gets up to the pair. Now it's Sastre, Basso Menchov and Di luca. Popovych has extended his lead over Cunego at the front to 1min. 6 km to go: Sastre attacks again. He looks gone. Basso goes after him while Menchov and Di Luca stay together. 5 km to go: Popovych is still way out in front. Di Luca goes again and Menchov closes quickly. Sastre has passed Cunego. He's now hunting Popovych. Now Basso and then Menchov and Di Luca have caught Cunego. Well back Armstrong is pulling Leipheimer who is seeing his Giro chances ride away up the road. 4 km to go: Sastre is 1min 40sec behind Popovych. Menchov attacks Di Luca. Di Luca sticks with the Russian. They are about 30sec behind Sastre. 3 km to go: Sastre closes to within 40sec of Popovych. Sastre has caught Popovych and now Sastre has the 20sec time bonus for winning the stage in his sights. I think Sastre is down about 3min in the GC. 2 km to go: Sastre then Basso at 24sec. Then Di Luca and Menchov about 42sec behind Sastre. 1 km to go: this stage is for Sastre, then Basso at 17sec. Menchov and Di Luca at 30sec. The finish: Sastre takes it. time is 7hr 11min 54sec. Di Luca and Menchov catch Basso. 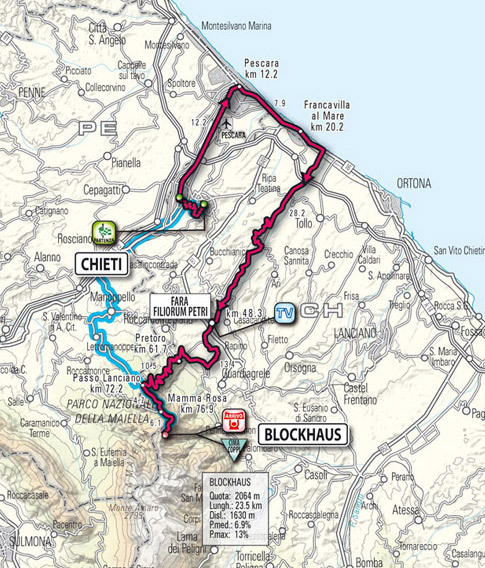 May 27, Wednesday: Stage 17, Chieti - Blockhaus, 83 km. Steady climb to a hilltop finish. Weather at Pescara at 1:00 PM local time: 84F (29C), sunny with wind from the north at 7 mph (11 kph). 20% chance of rain in the afternoon. 9. Carlos Sastre (Cervelo) s.t. 10. Lance Armstrong (Astana) s.t. 12. Tadej Valjavec (Ag2R) s.t. 17. David Arroyo Garcia (Caisse d'Epargne) s.t. 18. Valerio Agnoli (Liquigas) s.t. 19. Jose Rudolfo Serpa (Serramenti PVC-Diquigiovanni) s.t. 7. Michael Rogers (Columbia) @ 7min 5sec9. Km 6: The race started a little late. 172 riders departed today. The peloton is compact and riding under sunny skies. Km 10: As the peloton goes through Sanbuceto, Bouygues Telecom escape artist Thomas Voeckler has decided to test his luck on a break. He has 10sec on the pack. Others are going now. I'm sure each of the GC teams will want to have help up the road to assist their captains on the Blockhaus climb. Peloton has started to speed up. Km 13: The race has reached Pescara, Di Luca's home town. The break seems to be getting established. It has: Thomas Voeckler, Giuseppe Palumbo, Felix Cardenas, Ruggero Marzoli, Giovanni Visconti, Matteo Bono, Gonzalo Rios, Giuseppe Palumbo and Riccardo Chiranini. Looks like a well organized break, each rider taking short pulls. None are GC threats. the best placed is Cadenas, 104min down. There is another break 20sec behind them and the the peloton yet another 20 or more seconds back. Km 20: Through Francavilla al Mare, the speeds seem to be rather high. The peloton is a long single file. The Voeckler group at the front is 44sec ahead of the second break and 1min 44sec ahead of the Rabobank-led Peloton. The average speed of the race so far is 40.266 km/hr. LPR has gone to the front. They clearly want Di Luca to win the stage and get the bonus seconds. Km 28: The chasing break of 5 that was in the middle has been caught. The break is going 53kph and the pack is traveling at 51kph. The gap to the Voeckler group is 1min 27sec. 50 km to go: The road has started to rise and dip a bit. Voeckler applied some pressure and the break fractured a bit. It's come together again. The gap is 1min 45sec. Lots of Rabobank and LPR riders at the front of the peloton with Di luca keepng an eye on Menchov. And vice-versa. 42 km to go: The gap has grown to 2min 30sec. It's all LPR at the front of the peloton now with Rabobank sitting behind them. There are a few Cervelo riders riding next to Rabobank. Sastre has to do something today. There was a crash in the peloton involving Grivko and Astana rider Rubiera and a few others. They are chasing back on. At Villamagna, the lead has stretched out to 3min 5sec. 35 km to go: The finish at Blockhaus is starting cloud over. The gap to the break is down to 2min 46sec. LPR's efforts at the front of the peloton are starting to pay off. 30 km to go: Petacchi has gone back for water bottles for his LPR teammates. I guess they won't need him on the final ascent to Blockhaus. Gap is 2min 56sec. Visconti took the intermediate sprint followed by Palumbo. Look out! Cervelo has moved its team to the front of the peloton. 25 km to go: Cervelo is still at the front of the peloton, driving hard. Gap to the break is now 2min 6sec. Thick fog has enveloped the finish line. Riders in the break are in their small front rings. Average speed for the race so far is 41.194 kph. 13 km to go: Sorry for the silence, my computer froze. The break has been caught. Pellizotti is a little off the front with Lance Armstrong chasing him down! Armstrong is 10sec behind Pellizotti. The other GC men are at the front of a very reduced peloton. Maglia Rosa group is 30sec behind Pellizotti. 10 km to go: Bam!! Di Luca goes with Garzelli on his wheel. Menchov closes up with Basso. Armstrong is caught. He has tagged on to the Maglia Rosa group. No Sastre here. Sastre is chasing now. There's a real gap from him up to the Menchov group. Di Luca is hammering with Menchov on his wheel. Pellizotti is still off the front. Armstrong has been dropped and been picked up by Sastre. 7 km to go: Garzelli had been dropped by the Menchov group and then rejoined. Sastre is chasing with Simoni, Armstrong and Szymd on his wheel. Pellizotti still has 28sec on the Maglia Rosa group and 58sec on the Sastre group. Average speed for the stage so far is 36.7 kph. 5 km to go: Pellizotti's gap is still at 31sec to the Maglia Rosa (Basso, Di Luca, Garzelli and Menchov) group and 1min 20 to Sastre. Fog has lifted at the finish line. The Giro is getting away from Di Luca and Sastre. 3 km to go: Pelizotti still looks good. He has 42sec on the Maglia Rosa group and 1min 18sec on the Sastre group. Di Luca is still doing all the work leading Menchov, Basso and Menchov. 2 km to go: Di Luca has attacked and Menchov is the only rider to go with him. Di Luca is digging deep! The finish: Pellizotti takes the stage. The fog has come back. Garzelli has recaught Menchov and Di Luca. Garzelli leads in Di Luca and Menchov who has to let them go. Menchov stays in pink. 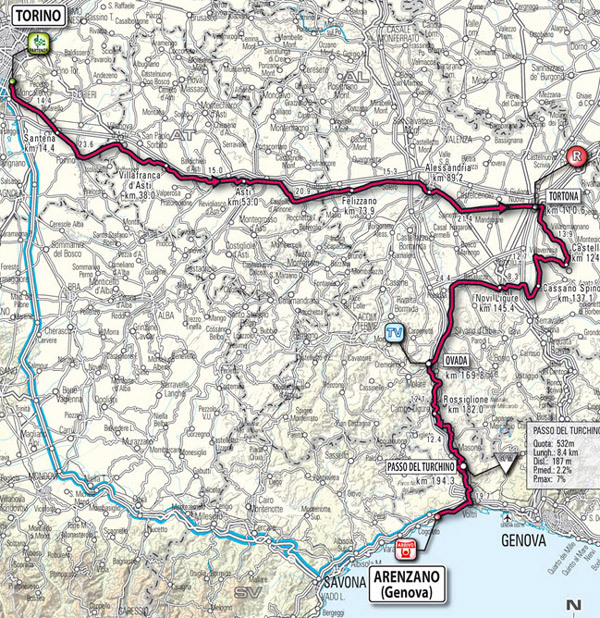 May 28, Thursday: Stage 18, Sulmona - Benevento, 182 km. Mixed terrain. Weather in nearby Campobasso: Forecast is for mostly sunny but with a chance of scattered showers, 69F (21C)with the wind from the north at 10 to 15 mph (15 to 25 kph). 3. Danny Pate (Garmin-Slipstream) s.t. 14. Fracnesco Gavazzi (Lampre) s.t. 15. Thomas Voeckler (Bouyges Telecom) s.t. 17. David Lopez Garcia (Caisse d'Epargne) s.t. 18. Francesco Masciarelli (Acqua & Sapone) s.t. 19. Kanstantsin Siutsiu (Columbia) s.t. Km 28: 172 riders departed from Sulmona. There is a serious rated climb which begins almost at the the day's start, the second category Piano delle Cinque Miglia. Gilberto Simoni attaked at the third kilometer but was brought back almost immediately. The peloton broke up into two pieces on the climb, separated by 40 seconds. Yesterday Stefano Garzelli was lamenting (I think cursed might be a better translation for maledetto) his terrible day on the stage 5 ascent to Alpi di Susi where he lost almost 7 minutes. Without that catastrophe, at 8min 3sec, he would be in the hunt for the Maglia Rosa. He certainly proved he had the chops yesterday when he outsprinted Di Luca and Menchov at Blockhaus. Km 43: The peloton came back together on the descent. The average speed for the first hour was 39.7 kph. 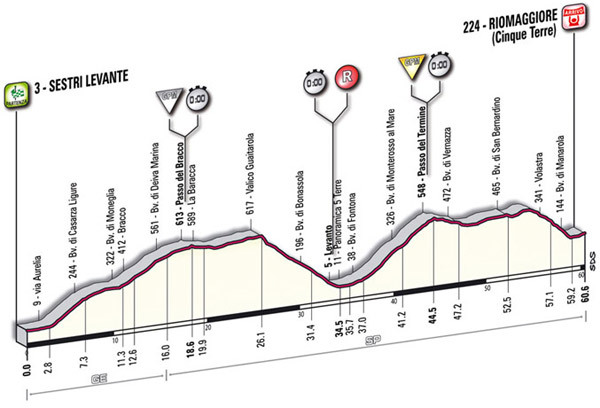 Km 53: At the crest of an unrated climb (Rionero Sannitico on the maps below) a group of about 21 riders has a gap. Michele Scarponi tried an earlier break on the climb and has been caught by the front group. Km 58: Now it looks like Yaroslav Popovych, Danny Pate, Gabriele Bosisio and Michele Scarponi have put together a break. Km 65: Right now it's the Popovych group followed by the break of 21 riders at 22sec and the peloton at 53sec. ISD rider Dymitro Grabovsky has clawed his way up to the Popovych group. There are 20 riders chasing the now 5-man Popovych group. Km 70: The 20 chasers have caught the Popovych group. There is now a break of 25 riders who are 1min 30sec ahead of the peloton. Km 74: This looks like the day's break. The 25 riders have a lead of 2min 20sec. Rabobank is riding tempo at the front. Km 80: Yup. the gap has stretched out to 3min 5sec. Km 83: Now the the leaders' advantage is 3min 45sec. Yaroslav Popovych (Astana) and Michele Scarponi (Serramenti). Notably both riders in real contention for the young rider's white jersey, Francesco Masciarelli and Kevin Seeldrayers (current owner) are in the break. They are surely watching each other rather closely. Thomas Voeckler, Giovanni Visconti, Thomas Lovkvist, Constantsin Siutsou, Lars Ytting Bak and Evgeny Petrov are there as well. This is a high-powered group, none of whom have any hope of winning the Giro. Their only threat is to those who want a stage win today. That would probably include Di Luca. Km 91: The lead is now 4min 10sec. The average speed of the second hour was a brisk 45.10 kph. Km 97: 5 min lead now. Km 107: The peloton has gone through the feed zone. The streets look wet. There have been some sprinkles. The break's lead is 4min 45sec. Km 112: The lead has gone back up. It's 6min 15sec. Average speed for the race so far is 43.255 kph. Km 121: Milram and Caisse d'Epargne are helping out with the chase. With Cavendish and Farrar having left the race, perhaps they hope again that their Robert Forster will have a good day in a mass sprint. Km 127: The gap has come down a bit, 5min 30sec. Km 136, 46 km to go: The speed has picked up a bit. Average for the day is 43.89 kph. Km 146, 36 to go: Giovanni Visconti won the intermediate sprint at Telese Terme. The peloton went through the sprint point 3min 57sec later. It looks like the chase is growing more determined. 35 km to go: The gap went down 7sec, it's now 3min 50sec. The break is going 46 kph while the chasing peloton is screaming along at 52 kph. 30 km to go: The peloton just went through the 30 km to go mark 3min 18sec after the break. Fuji-Servetto, Milram and Caisse d'Epargne have done a lot of work at the front of the peloton. 25 km to go: Gap is 3min even. The peloton is strung out from the high speed of the chase. The break is going 50kph, the peloton is racing at 54kph. 20 km to go: Gap is 2min 42sec. 15 km to go: Here we go. The attacks are starting to come from the break. Grabowsky was the first to try his luck. Looks like Scarponi, Pate, Cardenas, Scarponi are in a move of 7. The dropped break riders are coming back. 10 km to go: In Benevento. The fugutives from the break seem to have made their move stick. Jason McCartney is in this lead group. He tried to get away but was brought back. They have 36sec on the remnants of the break. 5 km to go: It Cardenas and McCartney with a gap on the front break. 3 km to go: It's still McCartney and Cardenas. The peloton is 3min 38sec back. The finish: No one was giving up. Cardenas and McCartney were caught and the attacks kept coming. Devenyns went first then Michele Scarponi went by Danny Pate. Michele Scarponi takes the stage. Di Luca followed Menchov over the line, not trying to get a gap. 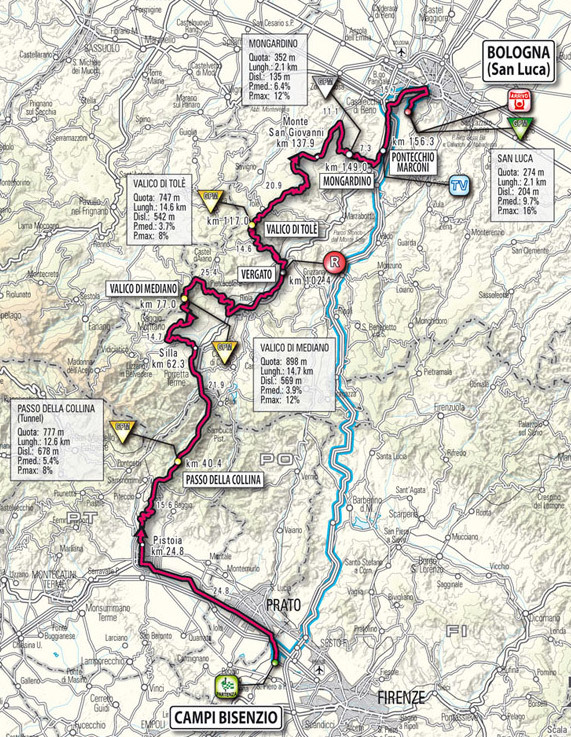 May 29, Friday: Stage 19, Avellino - Vesuvio, 164 km. Mixed terrain with a hilltop finish. Weather at Salerno at Noon, local time: 79F (26C), partly cloudy with the wind at 7 mph (11 kph) from the south. 4. Denis Menchov (Rabobank) s.t. 11. David Arroyo Duran (Caise d'Epargne) s.t. Km 7: The race started at 1:06 PM, local time, with 171 riders left in the race. No breaks yet. 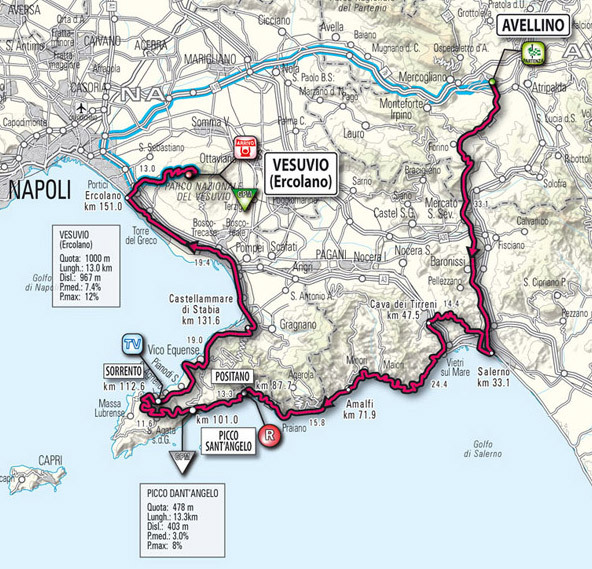 Today the Giro will race on the Amalfi Road, one of the most beautiful stretches of pavement in the world. 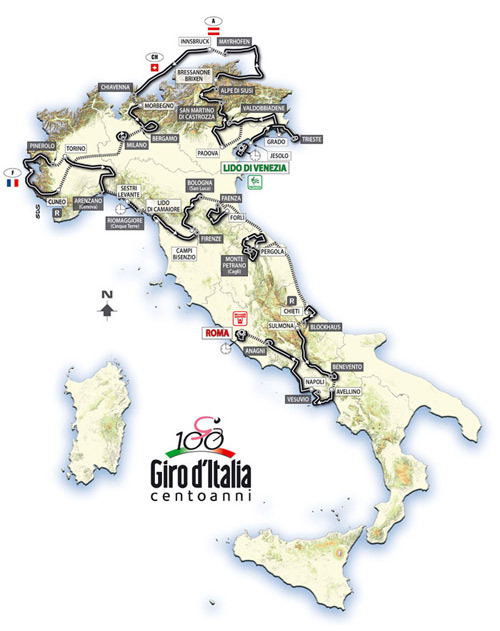 It hugs the coastline from Vietri sul Mare to Sorrento (see the route map below). Km 30: The day's break is probably gone. At the 16th kilometer Yuri Kirvtsov (Ag2R) and Mauro Facci (Quick Step) attacked. The duo currently have a 5-minute lead. Both riders are hours down on GC so there is no threat from that department. Certainly if Di Luca and Sastre want to claim the bonus seconds in play for winning the stage they'll have to make sure the break is eventually shut down. Km 62: Facci and Krivtsov have a lead of 6min. LPR is at the front, keeping the break withing closing distance. Menchov had a flat, but he was back in the peloton with little trouble. Average speed for the first hour was 49.8 kph. Km 74: LPR is working hard at the front of the peloton which is riding along magnificent Amalfi Coast. The gap to the Facci/Krivtsov pair is down to 4min 20sec. Armstrong fell on one of sharp corners along the very narrow road. He's up, has teammate Rubiera to help him and is chasing back. Km 81, 82 km to go: Armstrong has rejoined the peloton. 76 km to go: The break has gone thorugh Positano 4min 40sec ahead of the peloton. There isn't a level or straight meter of pavement on the Amalfi Road. 67 km to go: Out of Positano, after the feed zone, the race climbs the Picco Sant'Angelo. LPR is still slaving away at the front of the peloton. Menchov's Rabobank men are right behind. Gap between Kivtsov and Facci to the peloton is is 4min 38sec. 63 km to go: At the top of the Picco Sant'Angelo. Facci went over first. The gap back to the peloton has been closed to 4min even. Andriy Grivko has left the peloton and took third over the top. Mauro Facci and Andriy Krivtsov descending, in the lead. Maglia Rosa group 4min 35sec behind Facci/Krivtsov. Km 112, 51 km to go: In Sorrento there is an intermediate sprint.The escaping pair contested the sprint with Krivtsov taking the win. Facci isn't happy about that and wags a finger at Krivtsov. Pack is 3min 55sec back. Looks like Grivko is sitting up and is caught by the pack. LPR still at the front of the peloton. Average speed for the third hour is 37.6 kph. 41 km to go: The leaders go through Vico Equense. The entire LPR team is at the front of the peloton with Di Luca the last of his team in a straight line. Then come the Rabobank rders and some Liquigas team members. Is Pellizotti feeling frisky? Gap from Facci and Krivstov to the peloton is 3min 40sec. Average speed of the race so far is 37.027 kph. 35 km to go: Just before arriving at the city of Castellemare di Stabia and now the riders are on the coast. They can see the gigantic form of Vesuvius waiting for them across the Golfo di Napoli (Bay of Naples). Ooh! The gap is now 2min 40sec. 30 km to go: Average speed is 37.33 kph. Gap is 2min on the button. Alessandro Petacchi is working at the front of the pelton for Di Luca. Vesuvius is looking ever larger. 25 km to go: Krivtsov and Facci are looking gassed. They are still working, but both are rocking in the saddle, struggling to stay on top of their gears. The gap is down to 1min 38sec. 20 km to go, 7 km to the start of the ascent: Getting close. Gap is down to 1min 15sec. In the peloton there is a lot of movng up, bustling for position before the start of the climb. I think this ascent is going to be something. The riders who want to take on Menchov will need the entire ascent to get enough time. Gap is 37sec. They'll be caught shortly. The leading LPR rider is hammering at the front, out of the saddle. 15 km to go: The speed seems to be going up. LPR is relentless. Liquigas is fighting to get to the front. In Ercolano and the real start of of the Vesuvius climb. The break is caught. The pack is splintering. Where's Di Luca? The LPR team is looking around. there he is, a few riders back. Garzelli, Menchov and the others are at or near the front. 10 km to go: Liquigas is leading. A couple of LPR riders seem to have gone to the front to slow things down as Di Luca keeps moving up to the front. Liquigas rider Agnoli takes off. Now Lampre rider Tiralongo takes off. Tiralongo has caught Agnoli. Now it's 2 LPR riders at the front of the peloton with Di Luca sitting in third. No action from the contenders. Every kilometer of intact peloton plays to Menchov's advantage. Here we go: Basso and Garzelli take off. Bam!! Di Luca goes with Menchov on his wheel. The peloton sticks to them. 8 km to go: It's Basso and Garzelli at the front. Now Sastre has taken off after Basso. Sastre is riding like a rocket. 7 km to go: It's Sastre and Basso leading a very small peloton. They are 15 seconds ahead of the Maglia Rosa group. Simoni is trying to get up to them. Garzelli had been caught by the peloton but now he goes again. Sastre is doing all the work of leading Basso up the volcano. David Arroyo Duran has caught Simoni. 5 km to go: Sastre still leads Basso. Further back is Garzellli then Simoni/Arroyo-Duran. Popovych is leading the Maglia Rosa group. Di Luca goes again and takes Menchov and Pellizotti. Pellizotti counters but can't get away from Di Luca. Simoni has been caught. Di Luca group has been caught as they slow. Sastre has 40 seconds now. Armstrong is in the Maglia Rosa group. 3 km to go: Pellizotti goes again. Di Luca goes after him with Menchov (of course!) on his wheel. Sastre now has 48sec. Di Luca goes again and again with Menchov on his wheel. Pellizotti hammers them both. This is incredible! 2 km to go: Sastre goes through 58sec ahead of Menchov, Di Luca and Pellizotti. Pelizzotti won't give up. He's now finally got a real gap now on Menchov and Di Luca. Basso is up ahead waiting for his teammate Pellizotti. Di Luca keep attacking and can't drop Menchov. The finish: Sastre wins the stage. Di Luca and Menchov went by Basso, who had been dropped by Pellizotti. It's Sastre, Pellizotti and then Di Luca with Menchov on his wheel. 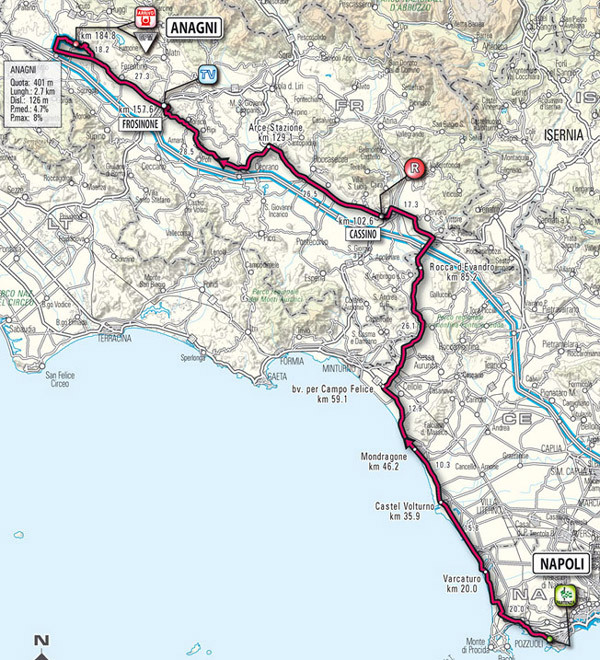 May 30, Saturday: Stage 20, Napoli - Anagni, 203 km. Mixed terrain. 8. Giovanni Visconti (ISD) s.t. 9. Simon Gerrans (Cervelo) s.t. 10. Serge Pauwels (Cervelo) s.t. 11. Denis Menchov (Rabobank) s.t. 13. Rubens Bertogliati (Serramenti PVC-Diquigiovanni) s.t. 15. Alexander Serov (Katusha) s.t. 16. Renaud Dion (Ag2R) s.t. 17. Damiano Cunego (Lampre) s.t. 19. Tadej Valjavec (Ag2R) s.t. 20. Christopher Froome (Barloworld) s.t. Km 34: 170 riders departed Naples this morning. Yesterday Dario Andriotto (Acqua & Sapone) crashed on the Amalfi Road section and had to retire. The day's break seems to have formed very early. At the fourth kilometer 8 riders escaped and they now have a gap to the peloton of 3min. Three teams are at the front keeping the break's from getting out of hand: LPR, ISD and Columbia. Km 47: The gap is down to 2min 33sec. The average speed for the first hour was 46.2 km/hr. Km 61: The break's lead has grown. It's now at 3min 43sec. David Lopez Garcia (Caisse d'Epargne) was hurt badly enough in a crash to require transport to a hospital. Here are the riders in the break: Robert Forster (Milram), Pablo Lastras Garcia (Caisse d'Epargne), Anders Lund (Saxo), Feliz Rafael Cardenas (Barloworld), Ben Swift (Katusha), Angel Gomez (Fuji-Servetto), Francesco De Bonis (Serramenti) and Guillaume Bonnagond (Ag2R). Garcia is the best place rider at only 1hr 29min down on GC. Forster is over 4hr behind Menchov. Km 82: The peloton isn't letting this break have much freedom. Their lead is 2min 43sec. 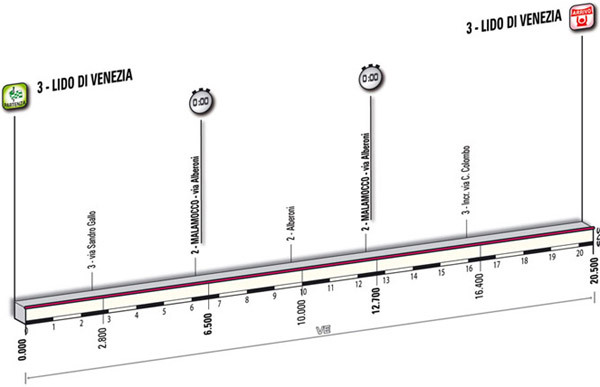 I wonder if Di Luca, a good sprinter, is going to try for the bonus seconds in the intermediate sprints. Km 102: At the feed zone in Cassino the gap is 3min 15sec. The average speed after the second hour is 45.1 kph. Km 113: Currently the break is going 46 kph and the peloton is rolling along at 51 kph. The gap to the break of 8 riders is 3min 11sec. Km 119: Passing through Roccasecca the gap is down to 2min 41sec. Looks like Sastre had a flat and has a couple of teammates dragging him back up to the peloton. Weather in Rome for tomorrow's time trial isn't pretty. There is a 70% chance of rain in the afternoon. Perhaps a quarter inch may fall. Acqua & Sapone is helping the peloton chase. Km 137, 66 km to go: The break has reached Ceprano. The peloton is really lined out, chasing the break hard. Silence-Lotto, Acqua & Sapone, LPR are at the front of the peloton. The efforts are paying of. The gap to the break is down to 1min 9sec. Average speed of the race so far is 45.2 kph. 60 km to go: Both the break and the chase are well organized. The break has a good circular pace line going and it looks like everyone is taking his pull. LPR, Silence-Lotto and Acqua & Sapone are taking turns at the front of the peloton. The gap has been cut down to 53sec. 55 km to go: 37sec now. Will they be caught in time for the intermediate sprint at Frosinine? 15sec now. I think so. 48 km to go: The break is caught, LPR is at the front. There are 6 bonus seconds in play in the intermediate sprint. Pack is really compact. Di Luca is moving towards the front as the race enters Frosinone. LPR is going for the sprint doing what looks like a leadout train. Menchov has jumped on Di Luca's wheel. 45 km to go: Menchov goes, seemingly catching Di Luca by surprise. It looks like Di Luca's teammate Alessandro Petacchi kept Menchov from grabbing the sprint. It was Petacchi, Menchov and Di Luca. Menchov has grabbed 2 second overall gain with his second place in the intermediate sprint. Di Luca lost ground as a result of his tactical set-piece. Right afer the sprint 3 riders escaped and have a 15sec lead: Agnoli, Brutt and Fothen. 36 km to go: Now it's just Pavel Brutt and Markus Fothen in the lead by 15sec. 45.21 kph is the race's average speed so far. 30 km to go: The gap is 37sec. Silence-Lotto and ISD are at the front of the chasing pack. 22 km to go: Average speed for the day is 45.14kph. We are closing in on starting the Anagni circuit. Fothen and Brutt are caught. Gruppo compatto. 19 km to go: On the first climb to the finish things are breaking up Di Luca and Menchov are are near the front. A Liquigas rider is dishing out some real pain at the front. The peloton is coming back together after the climb. Now a trip through the city and then another trip up the hill. 15 km to go: The descent is really fast and the peloton is really lined out. Three riders have pulled away: Anthony Charteau, B. Huzarski and Paolo Tiralongo. They have about 15sec. Given Di Luca's ongoing aggression, I can't see how LPR will let them stay away. Silence-Lotto may have ambitions for their fantastically talented Philippe Gilbert. Silence-Lotto doesn't have much to show for this Giro. Marco Pinotti made it up to the lead trio. 8 km to go: 23sec. Liquigas is leading the peloton. 5 km to go: 28sec. 3 km to go: The final ascent of the Anagni has started. Lead is only 20sec. The 4 riders will be caught. 2 km to go: LPR leads up the hill. Di Luca is riding third with Menchov right on his wheel. Bam! Philippe Gilbert goes with Thomas Voeckler on his wheel. The Finish: Gilbert takes the stage, Voeckler is second. Looks like no time bonus at the finish for Di Luca. 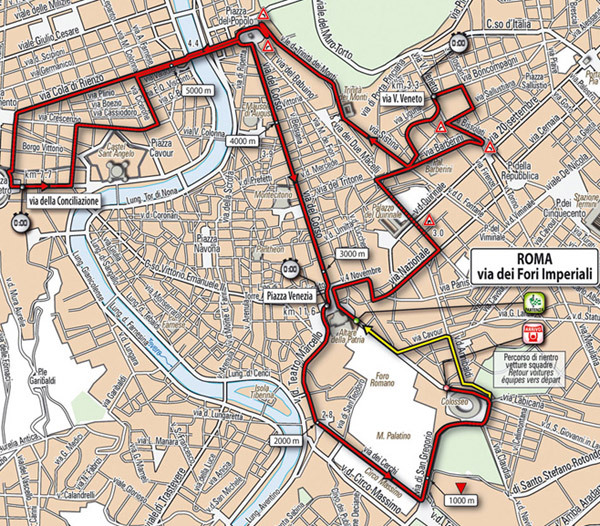 May 31, Sunday: Stage 21, Rome 14.4 km individual time trial. Flat. Weather at Rome at Noon, local time: 75F (24C), mostly cloudy with the wind from the south at 9 mph (14kph). Forecast is a 70% chance of light rain developing in the afternoon. Menchov crashed on wet cobbles in the final kilometers but remounted immediately and was able to preserve his lead. Di Luca went out with the fastest time at the first check point but ran out gas towards the end. 31 SOLER HERNANDEZ Juan M.